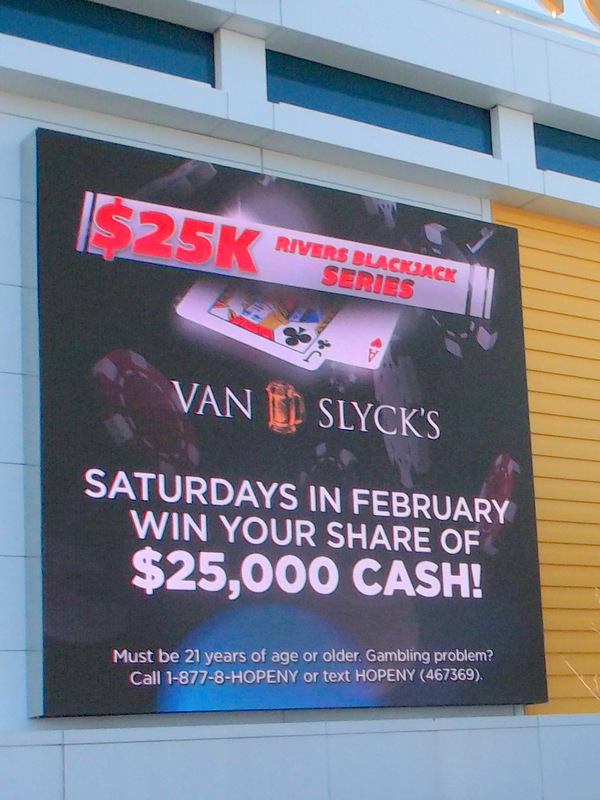 We can see, then, that the worrisome trend continued into the first month of the 3rd Year of Operation for Rivers Casino, despite Anniversary Month efforts to promote Poker and Table Games [see, e.g., Casino LED screen at right]. Is Rivers Casino turning into that cursed form of urban “development,” a mediocre regional casino attracting predominantly local patrons who can least afford to gamble, and siphoning off entertainment dollars that were once spread across the local market for leisure activities — and, with no palatable solutions in sight? No matter what you call this phenomenon — “slotsification”, “slotsploitation”, “Slotsnectady”, etc. — we should be concerned, because slots are the most addictive form of casino gambling. 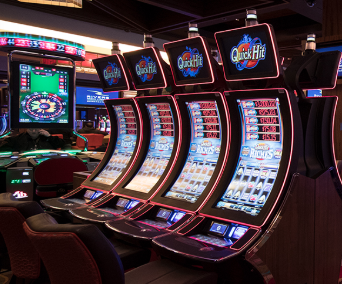 Slots also appeal more than other forms of casino gaming to many members of the most vulnerable groups of prospective gamblers, seniors and the elderly and low-income. Just in time for the 2nd Anniversary of Rivers Casino operating at Mohawk Harbor, the State Comptroller Thomas DiNapoli issued a 17-page Audit report the first week of February which concluded that the State has failed to assess the human toll of its gambling expansion and needs to better understand the problem, so that its limited resources can be best used to prevent and treat gambling addiction. The stated purpose of the report, “OASAS Problem Gambling Treatment Program (Report 2018-S-39, Feb. 2019), was “To determine whether the Office of Alcoholism and Substance Abuse Services (OASAS) has sufficient treatment programs for problem gamblers.” See, a Gazette article (Feb. 7, 2019), and related column by Sara Foss. ; and a Times Union article and editorial. It seems clear, that we need to understand who is playing slots at Rivers Casino and how we can help assure that having a casino in our midst does not spread the infection of problem gambling in our community. 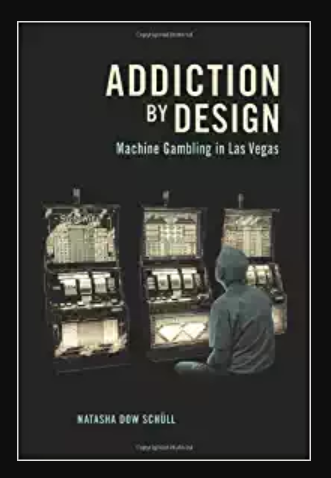 It may be merely a coincidence that this is happening after Rivers Casino operated for a year in Schenectady, but “Studies by a Brown University psychiatrist, Robert Breen, have found that individuals who regularly play slots become addicted three to four times faster (in one year, versus three and a half years) than those who play cards or bet on sports.” From “Slot Machines Are Designed to Addict” (New York Times, October 10, 2013, by Natasha Dow Schüll). 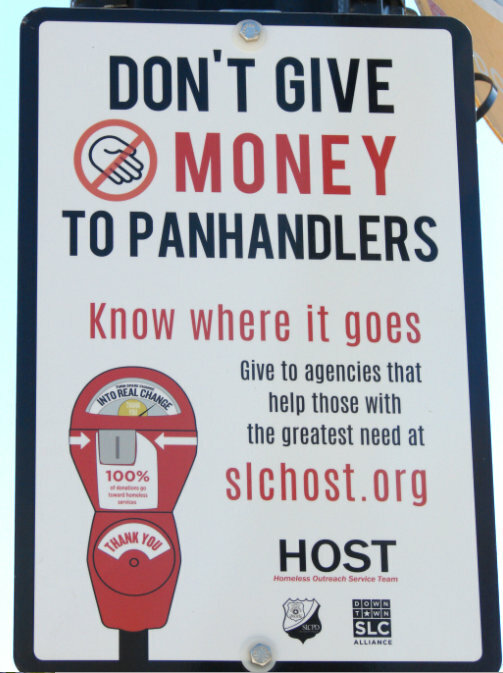 Whatever the cause, Slotsification will increase the social costs to individuals, families and the community from having this Casino in our midst. If the portion of Rivers Casino revenue from slots keeps growing, it will surely lead to the very situation casino opponents most feared: Significant growth in problem gambling and all its consequences, but with a disappointing boost in revenues for the City and County, far less than our “leaders” promised when selling the project and deciding to take the risk of inviting an urban casino to Schenectady. March is Problem Gambling Awareness Month, and we will soon be posting a piece about Problem Gambling and Slots. 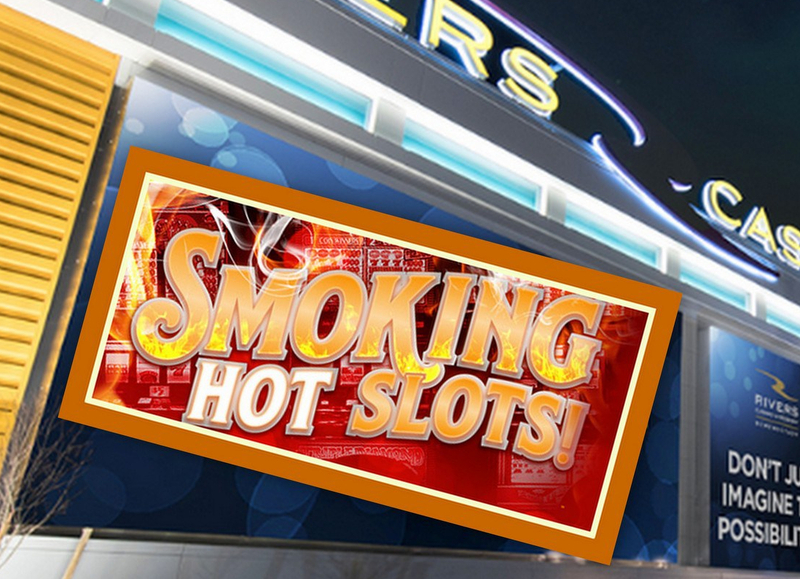 a Smoking Patio with slots & drinks means non-stop slots play!! The lower-than-projected total of gambling dollars and customers brought in by Rivers Casino at Mohawk Harbor in its first year of operation disappointed just about everybody. (See, e.g., our post on Projections vs. Reality.) So, it is understandable that the increase so far this year in Gross Gambling Revenue [the amount bet minus winnings paid out, called “GGR”] has been broadly welcomed in our community. Nonetheless, Sara Foss at the Schenectady Gazette was correct to voice concerns last Sunday about the significant increase of gambling revenues this year earned from Slots and other Electronic Table Games [ETG]. See “Foss: Increase in casino revenue comes with social costs” (Sunday Gazette, Aug. 5, 2018). That is because the clear consensus of experts and observers is that slots are the most addictive form of casino gambling. Indeed, from the perspective of potential social costs and harm to gamblers and their families, the situation is very serious. I’ve tabulated the numbers, and it is clear that additional revenue from SLOTS/ETG (Electronic Table Games) is alone fueling the increased gambling revenue at Rivers Casino in its 2nd year of operation. I call this process “Slotsification”. Below is a comparison of the first six months in which Schenectady’s Rivers Casino was operating [Feb. to July of 2017] with the same six months in 2018, after one full year of operation. I used the most recent Monthly report posted at the Gaming Commission’s site, and the Casino’s weekly reports. In sum, Total GGR is up almost 10% at Rivers Casino, with Slots/ETG revenue up 19.3%, but both Table Game and Poker Game GRR down compared to the same months in 2017. The increase is all from Slots. In addition, looked at in the aggregate, Slots/ETG revenues were 63% of GGR in Feb-July of 2017; but they were 68% of GGR in Feb-July of 2018. It would be helpful to know whether more people are choosing to play slots, or whether slots players are playing longer. Furthermore, for the full year since the 1st Anniversary of Rivers Casino, Slots/ETG revenues were 68% of the Total GRR for the Casino. Is Rivers Casino in Schenectady trying to “slotsify” its casino revenue, to maximize its profits? 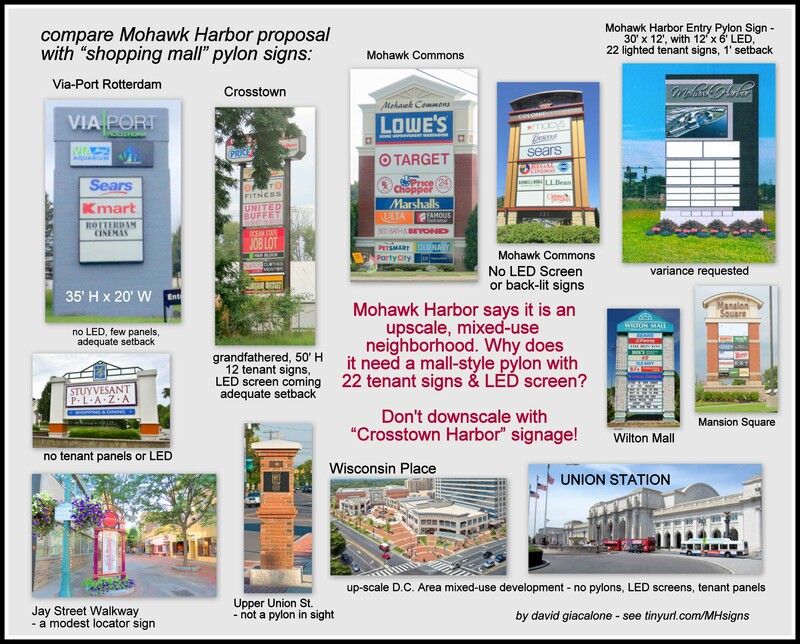 Is this also a result of growing problem gambling among Schenectady’s slots players, along with a growing indifference by those who like table games to spending time along the Mohawk? What about Millennials? Has Rivers also decided to make more money by luring in millennials, who spend on food, drink and entertainment, rather than on gambling when at Mohawk Harbor? That helps Rush Street and Galesi Group profits, but does not increase gambling tax revenue receipts for the City and County. [See the article on Millennials and Casinos quoted at length below.] The Casino does not have to reach its bloated projections to be a business success. Casinos across the nation are suffering from a generation gap, especially at the slot machines, as young people seek more exotic electronic games like the ones they can play on smartphones from anywhere. That’s a problem not just for casino operators, but for the 23 states that rely on revenue from casino taxes, particularly from lucrative slots, to help balance their budgets and fund new priorities. It is easy to be flippant and say, “Don’t ask Casino Opponents, we told you so,” back when our elected and appointed political leaders, and businesses hoping for a Casino Gravy Train, refused to even acknowledge the risks. Well, we did tell you so (e.g., this post), precisely because we feared just this situation: Big Problems without Palatable Solutions. No Answers for getting out of the Casino Casualty Syndrome and the related suffering of families and individuals; lots of temptation to seek more favors for the Casino, such as legislation with tax reductions or gimmicks (such as a marketing allowance), or spending $2 million on a Large Vessel Dock along Mohaw Harbor; plus, a lot of uncertainty and pain for employees at the Casino and associated businesses, if the Casino declines slowly, and especially if it fails and closes. No one should be surprised that the Assemblyman from Mohawk Harbor offers us no Lemonade Recipe and suggests no likely ingredients for the mix (other than a “not-a-bailout” tax break in the form of a marketing allowance that is too silly to even call specious). There is no secret, magical “sugar” to sweeten our Casino Lemons, and no law that will tow the wreck away. We are all left puckering up, and wincing, as the future rushes toward Slotsnectady, a City that once could Light and Haul the World, but now glories in “smart” lamp-posts, its homely-but-bossy Casino, and its beer-cultured Renaissance. 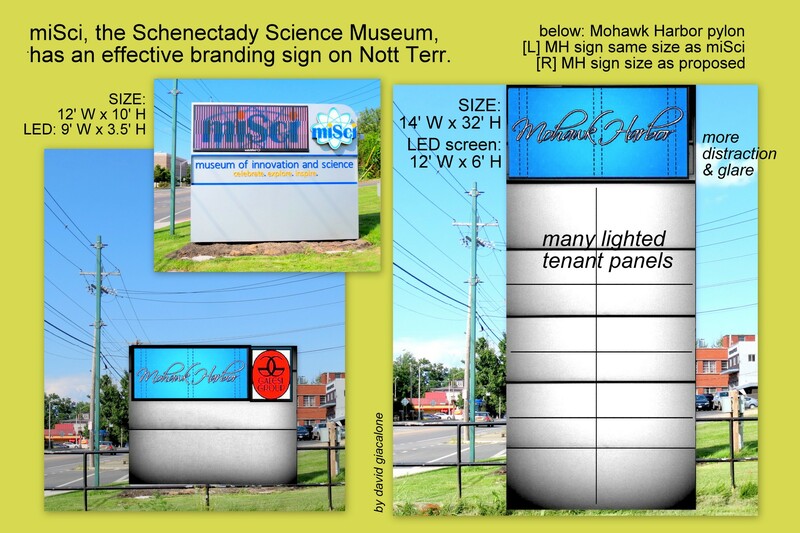 . . they gambled with Schenectady’s future, putting possible revenues ahead of the social costs, and acting as if there was nothing to lose . . Appendix: Why are Slots so Addictive? too many underage gamblers at Rush Street facilities? The Times Union (here) and the Gazette (here) are reporting that Rivers Casino at Mohawk Harbor’s operator, Rush Street Gaming, is appealing a penalty under consideration by a NYS Gaming Commission hearing examiner for violations of “regulations regarding permitting an underage patron on the gambling floor” and “permitting a person under 21 to make a wager at its facility.” Rivers wouldn’t discuss the dispute at this point, pointing to the pending hearings. You may recall that Rush Street was fined $6000 last year for allowing a minor to gamble at its Schenectady Rivers Casino. See “Underage gambler caught — but only after he won $1,300 on slot machines: Schenectady casino fined for letting him on the gambling floor” (Albany Times Union, by Paul Nelson, March 24, 2017); “State fines Rivers Casino $6k for underage-gambler” (Schenectady Daily Gazette, by Steven Cook, March 23, 2017). 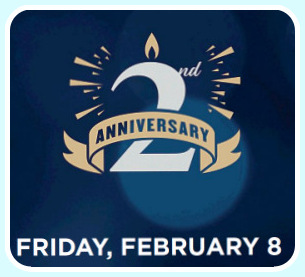 “We have a strong history when it comes to responsible gaming at our other properties, including operating under statewide self-exclusion policies, and we look forward to continuing that same record of excellence in Schenectady.” (See “New York to step up effort to battle problem gambling“, by Haley Viccaro, Schenectady Gazette, March 2, 2016). Similarly, the Rivers Pittsburgh casino has had multiple underage gaming fines. For example, in February 26, 2014, the Pennsylvania Gaming Control Board levied a fine of $15,000 against Rivers Casino in Pittsburgh for permitting an underage patron to gamble and consume alcohol at its property. The Pa. Board had also levied a $45,000 fine, in November of 2012, for four such incidents earlier that year. Moreover, Schenectady’s Pennsylvania Cousin Casinos have both also had multiple fines for permitting persons on the self-exclusion list to gamble, and even for extending credit, and sending solicitations to such persons. E.g., here and there. Should we expect the same here, too? The fines are obviously meant to motivate better procedures and practices to prevent underage and self-exclusion-list patrons into the Casino. Perfection can’t be achieved, but a real commitment, starting at the top and embraced by all Rivers employees, will hopefully mean a lot fewer violations. “Expect Tough Monitoring” should be the message in our community — especially aimed at our area colleges and high schools. Many people are concerned that the younger you are when introduced to casino gambling the more likely it is that you will develop a gambling problem. The mixture of alcohol and gambling is even more worrisome. See our posting “what will the casino mean for Union College students?“, which discusses such issues, and our particular concern over Rush Street Gaming’s practice of targeting younger gamblers. And see “Rush Street takes aim at adolescents” (Sept. 9, 2014). Also, check out a program sponsored by the Pennsylvania Gaming Control Board, called “What is Really At Stake“, to learn about the risks of underage gambling. 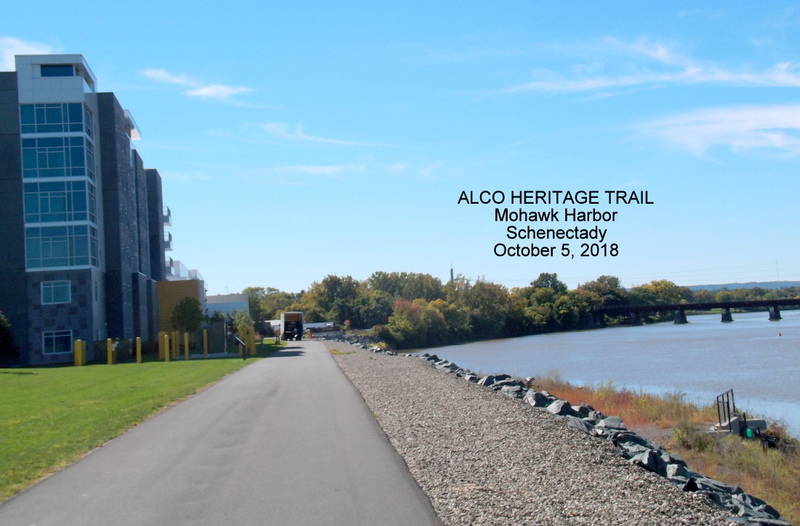 (July 3 and Oct. 5, 2018): Below we explain the reasons why we believe the Alco Heritage Trail is unsafe. When pressed on the safety issue in June, Metroplex Chair Ray Gillen insisted that a fence or guardrail would be installed “soon”. But, I have continued to wonder why neither the County or City, nor the hosting Casino, has installed temporary warnings signs and devices (i.e., quick and inexpensive orange safety cones and yellow tape), to keep visitors away from the steep, rocky slope, and slippery gravel. They plan to host thousands at Mohawk Harbor to see the Fireworks and concerts on July 3 and 4, and many events all summer. [photo at right taken at 11 AM, July 3] So far, the media has shown no interest in this issue. 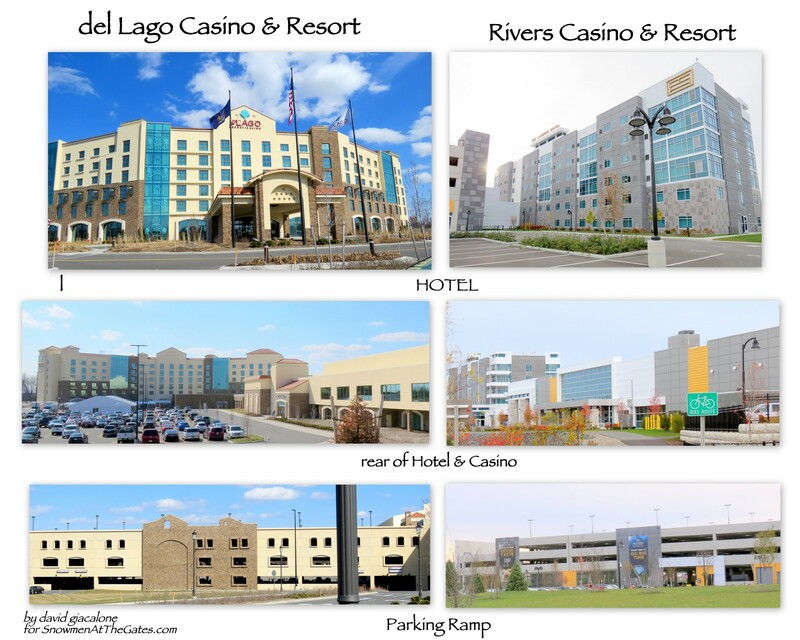 . . renderings of rear of Rivers Casino and Hotel: above June 2014; below July 2015 . . 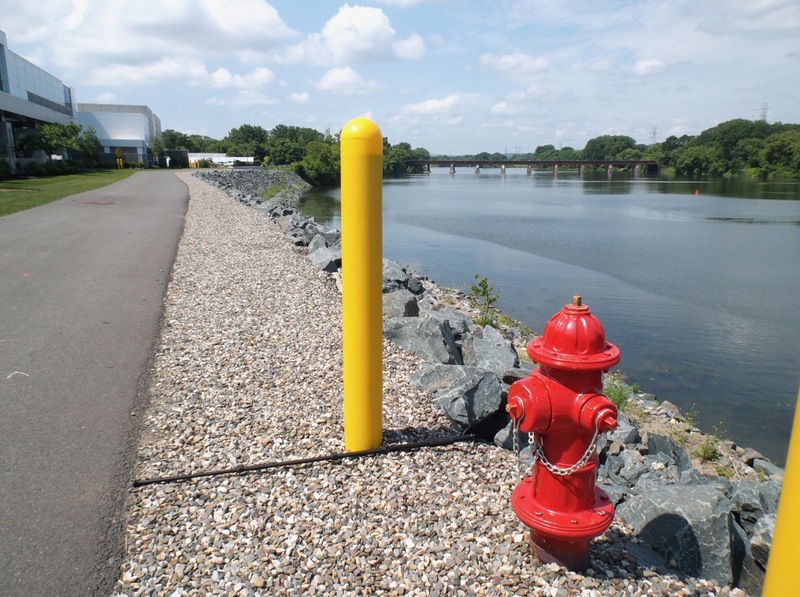 The trail shall have a width of at least 10 feet along the length of the Mohawk River shoreline and shall endeavor to be located reasonably adjacent to the undeveloped shoreline whenever practicable. There shall be an additional two feet of graded area on either side of the trail and an additional ten-foot buffer between the trail and the river. The trail shall be constructed of asphalt, synthetic composite, concrete, pavers, or other materials as approved by the Planning Commission. Trails and esplanades may include landscaped areas, sitting areas, benches, gazebos and suitable lighting facilities. 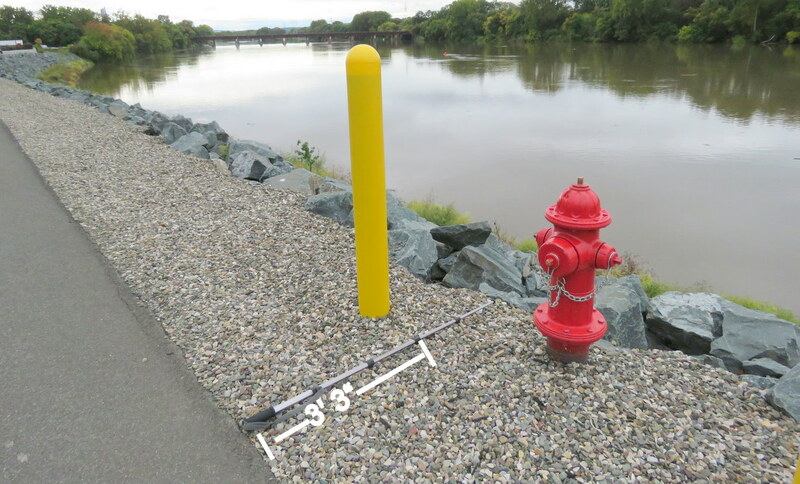 At no place has the required 12-foot buffer been installed on the riverside of the Trail. 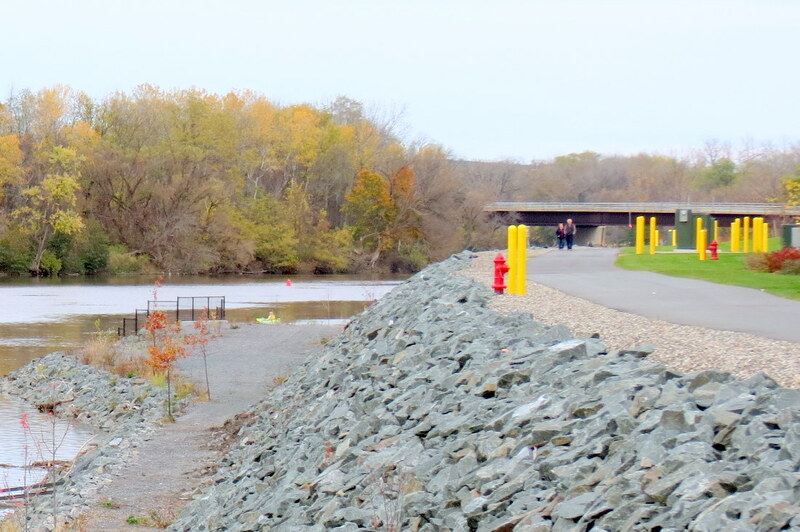 There also is no place for any sitting areas, benches, etc., along the riverbank side of the trail. 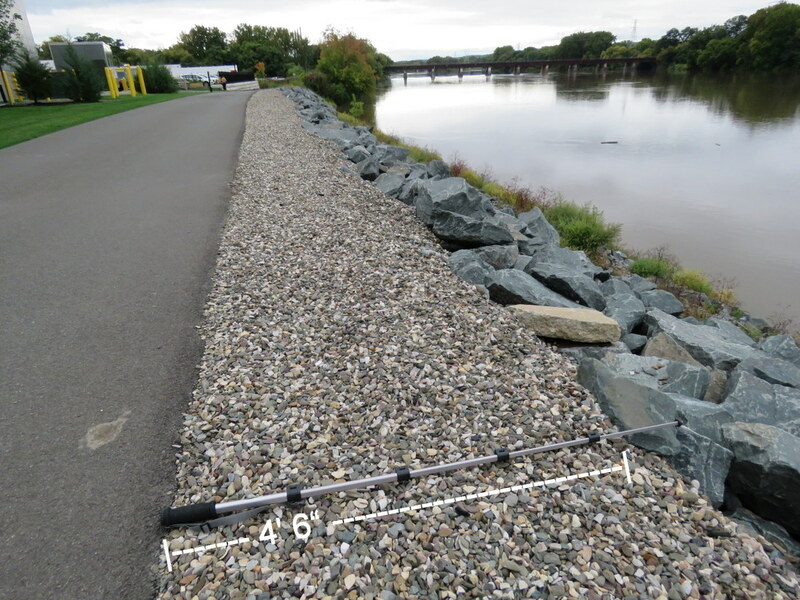 With only a loose gravel buffer of 3.5′ to 7′ on the river side of the trail (rather than the required 12 feet of graded buffer), and a very steep slope covered with sharp, rip-rap rocks, without guardrails installed, it certainly does not look safe enough to me. 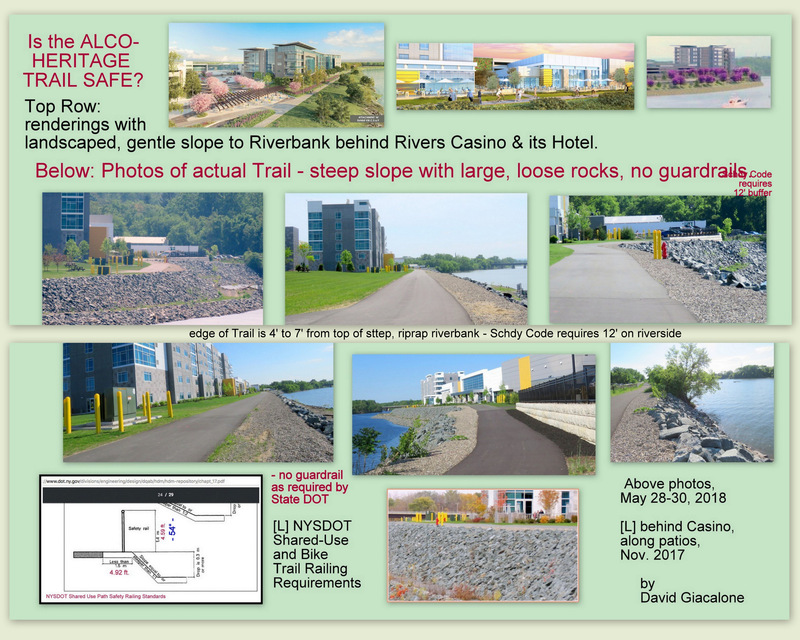 Part of my concern, of course, in addition to the normal mishaps on a busy shared use path, is the fact that the Trail passes within a couple yards of casino, restaurant and barroom patios, whose patrons will not all be sober, as well as by the Mohawk Harbor Marina and amphitheater. . . above: ALCO Heritage Trail seen, with zoom lens, from Freeman’s Bridge (May 29, 2018) .. I agree, it looks like a bad solution for bicyclists and perhaps also for the handicapped with “walkers” and other aid devises. 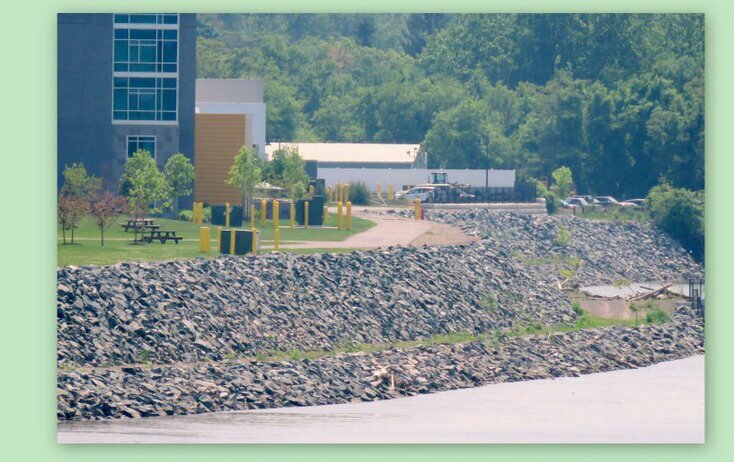 The rough gravel shoulder above the rip-rap was probably the selected solution to handle significant run-off from paved areas upslope; this was a cost-effective solution for that issue, versus a more sophisticated drainage plan. The problem is that if a bike or other wheeled devise, women with high heeled shoes, or people with walking aids (like canes) stray on to the gravel, they will fall onto the sharp rip-rap. I suggest a fence with “rub-rails” that keeps bicyclists of different heights and others on the trail. If observed use of the trail looks to attract a lot of strollers who tend to come to look at the River/harbor as part of their outing, it may be advisable to have the rail at a height that can be leaned on, benefiting walkers, but still giving some protection for bicyclists. County Legislators Have Not Replied. After three weeks, I have had no reply from several County Legislators to questions I had sent them about the timing of the official opening of the Trail and whether additional safety measures were planned. That was prior to my correspondence with NYCB. Corporation Counsel Has Not Replied. 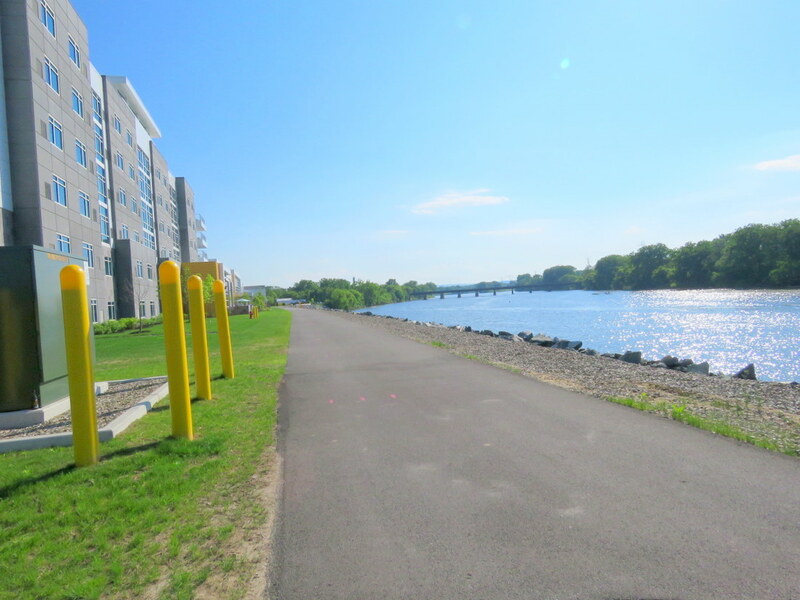 At the end of May, I also wrote to Schenectady’s Corporation Counsel, Carl Falotico, informing him of the comments from NYCB leaders, and asking whether the developers had received some sort of waiver from the Zoning Code requirements for the Harbor Trail. Three weeks later, I have not received a substantive reply from Mr. Falotico, who promised a reply when he was “ready to schedule a meeting” on the issues. update (Oct. 4, 2018): More than four months later, I have yet to receive any substantive reply from the City’s Legal Department, the County Legislature of Law Department, or Metroplex, nor any suggestion as to why/how the specific requirements of our Riverfront zoning code for this specific trail could be ignored when constructing the trail. 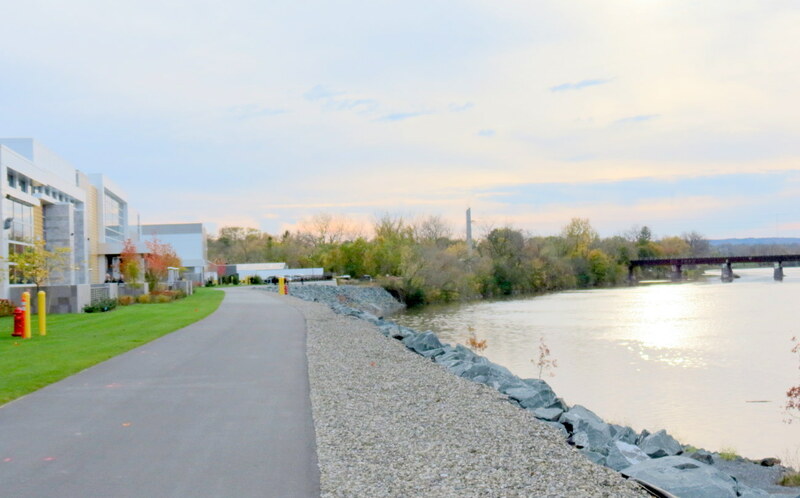 Bicyclists are already using the ALCO Heritage Trail, which connects Glenville’s Freedom Bridge road and Erie Boulevard with a riverside trail now ending at River Street in the East Front Street neighborhood, and then the Stockade. 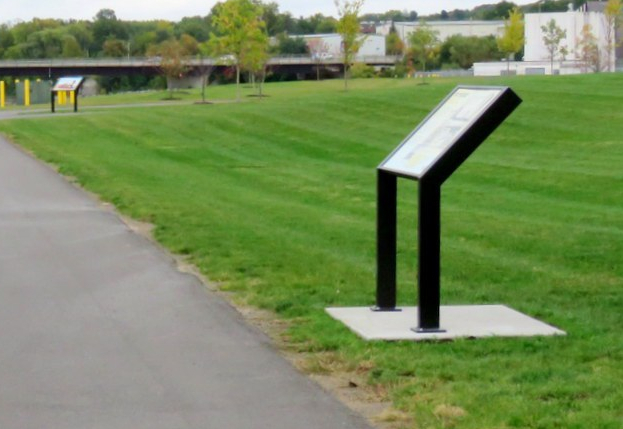 The CDPHP Bike Share program recently installed a bike share station at Mohawk Harbor, adding to the number of cyclists using the Harbor’s shared-use trail. 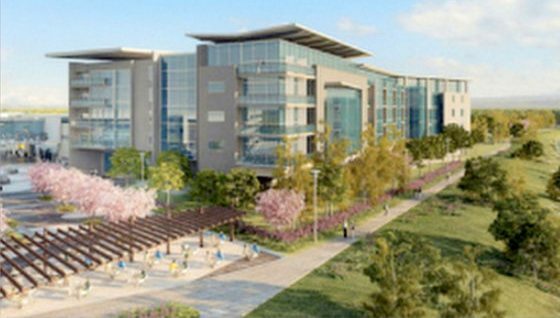 Summer concerts at the Marina’s amphitheater, drawing audiences in the thousands, and other Harbor and Casino events will also increase the number of pedestrians using the Trail. If the information above leaves you wondering about the safety of the ALCO Heritage Trail, or the process that has created a shared-use path quite different from our expectations, please let County and City legislators, and staffers working on bicycle planning and implementation know of your concerns. Any additional expense to build the trail, perhaps over a million dollars, is coming from New York and County taxpayers. In a March 2016 news article in the Albany Times Union, the Galesi Group bragged about “donating $100,000” to the cost of the Trail. 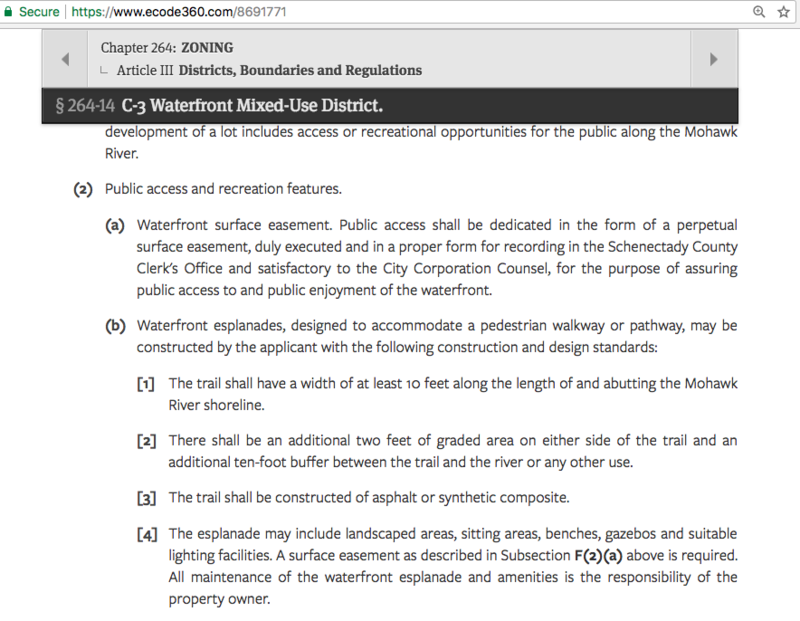 The original C-3 Waterfront Mix-ed Use District provisions included the following sentence, which was removed in the 2015 amendments requested by the Developer: “All maintenance of the waterfront esplanade and amenities shall be the responsibility of the developer.” The original permanent, perpetual easement “assuring public access to and public enjoyment of the waterfront” was, of course, also removed at the “request” of the developer. 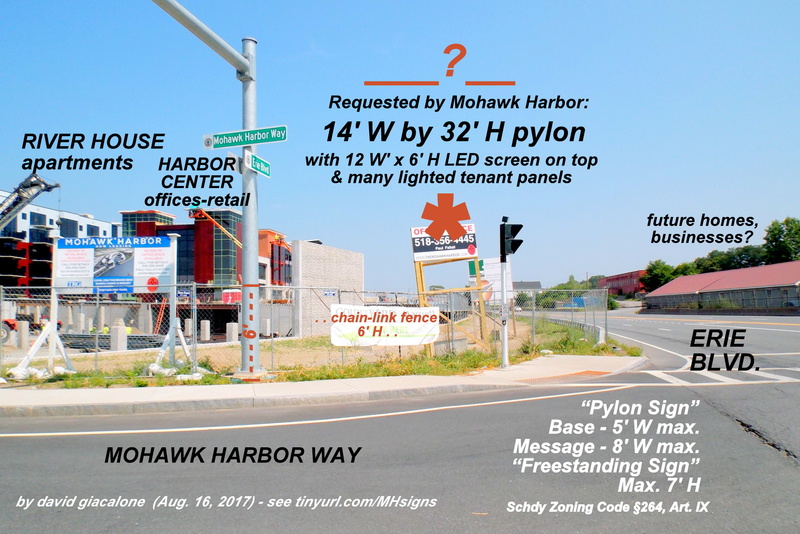 Taxpayer-funded Amenity: Having a shared-use path running through Mohawk Harbor is clearly an asset in selling and renting homes in the complex, and attracting tourists to its hotels. 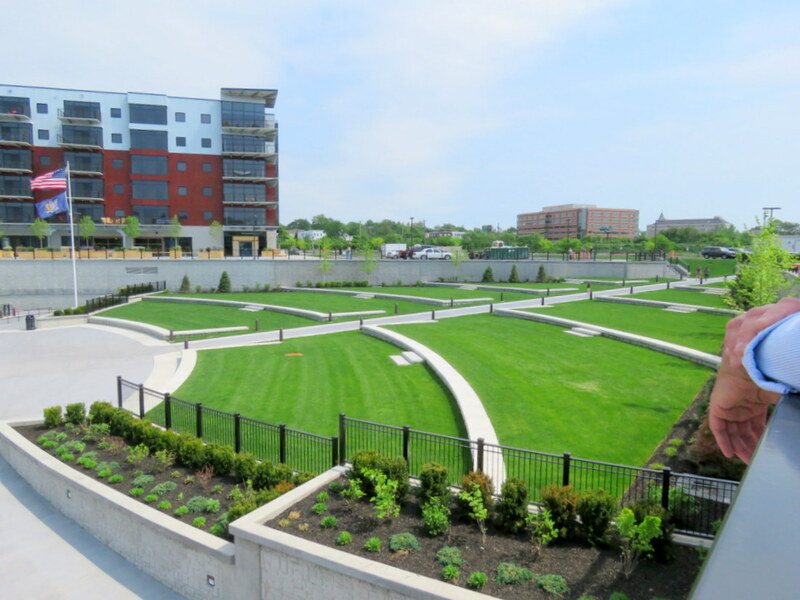 Thus, the short list of Extras on the Amenities page of the project’s River House apartments includes “Direct access to the NYS Hike Bike Trail.” In Philadelphia, Rush Street Gaming has spent millions of dollars to expand an already grand promenade and bike trail. Do our local leaders need more training in negotiating on behalf of our residents and taxpayers? p.s. 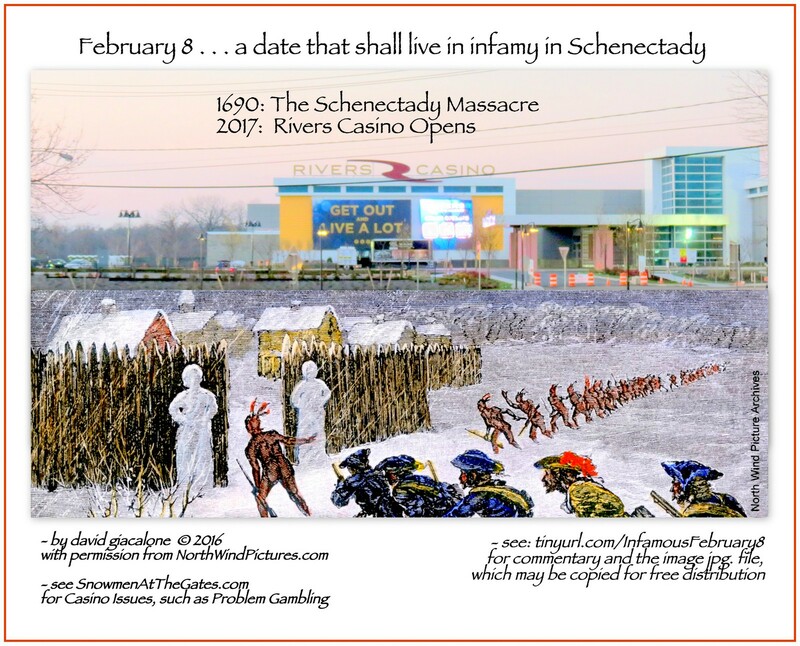 You may recall my first Infamy Montage which “celebrated” the opening of Rivers Casino on the anniversary of the Schenectady Massacre, when only Snowmen guarded the open gate of the Stockade (while the assigned guards relaxed at a nearby pub), allowing a band of French soldiers and marauding Indians to burn down the Stockade. 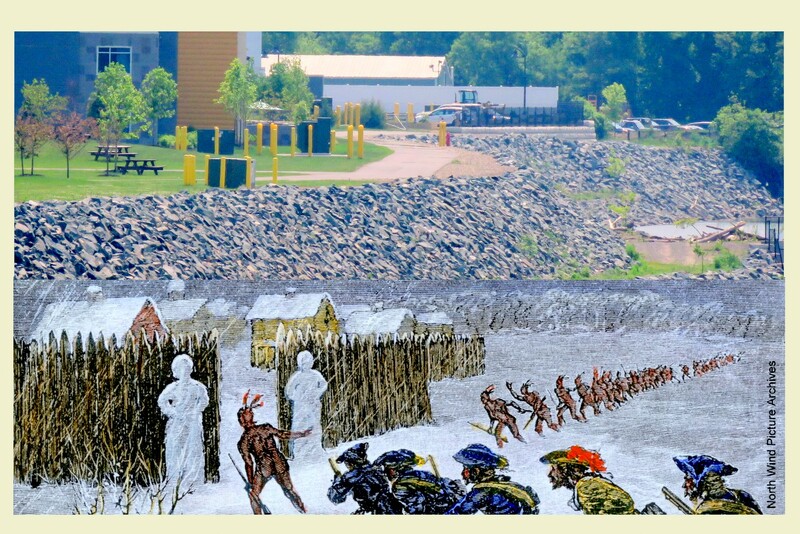 Below is my 2nd Infamy Montage below, which suggests that having Snowmen at the Gates of our City has led to an unseemly, unsafe, riverbank, trail, and harbor scene. follow-up (June 26, 2018): At a public meeting on June 21, 2018 (on the Extension Feasibility Study for the riverfront trail), Schenectady County Metroplex Authority chair Ray Gillen, told the author of this posting that there will be a fence or rail put up along the slope near the ALCO Heritage Trail in Mohawk Harbor. Given this acknowledgement of the possible safety hazard, I wondered whether any temporary safety measures were taken along the Trail — such as yellow tape or safety cones — in anticipation of the first Harbor Jam outdoor concert last Saturday, June 23, at the Amphitheater of Mohawk Harbor, which is across a lawn from the riverbank. follow-up: When taking photos from Riverside Park of the Casino’s July 3 fireworks, using a powerful zoom lens, I saw — as would be expected — a line of people of all ages and sizes standing along the top of the slope in the dark and gazing out over the River at the fireworks. why not? . . . . There were no such temporary safety measures Saturday afternoon. At about 3 or 4 cents a yard, what excuse is there for not stringing Caution Tape? Is this another case of our fearless leaders avoiding bad publicity at any cost — and at any risk? Moreover, apparently due to heavy rain earlier that day, the gravel between the Trail and the slope was slippery underfoot. When trying to shoot a photo from the gravel, my foot sunk into it, and the gravel slipped toward and under some of the rip-rap stones at the top of the slope. In addition, I saw a full-grown man, while in conversation with another man while standing on the gravel buffer, absent-mindedly step up on the rip-rap on the edge of the slope behind the Casino. What do you supposed little boys and girls will do? 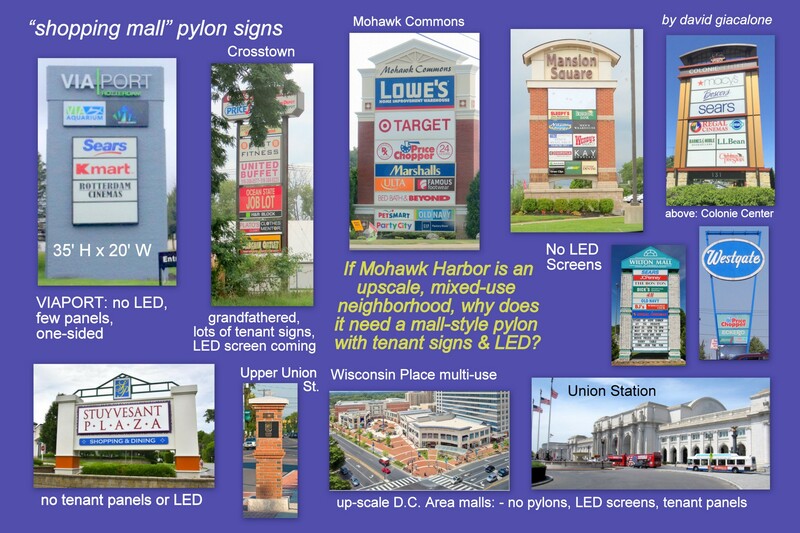 a slow week at Mohawk Harbor? Quick online searching* confirmed my assumption that casino resorts would be among the most popular destinations for America’s millions of travelers over the Memorial Day Weekend. So, given a refreshing breeze and blue skies, I was a little surprised by how few people were out and about at Mohawk Harbor mid-afternoon on Memorial Day. I had stopped by to catch the tail end of the Rollin’ on the River Car Show and Auction, hosted by Rivers Casino, and then spent about an hour sitting and strolling around the grounds and taking photos. A few pairs of bicyclists and a couple of dog walkers used the mixed-used path that runs through Mohawk Harbor, but I saw none of them stop while traversing Mohawk Harbor. No one spread a blanket or sat at the lovely, manicured Amphitheater, despite its unobstructed view of the Marina. Perhaps all the Holiday Weekend trekkers had already started their return trips home, or were squeezing in one last cook-out at a relative’s or friend’s backyard. It made me wonder, though, how much gaming action had been going on at Rivers Casino over the weekend. The weather on Saturday and Sunday had enough rain in the forecast to motivate indoors activity such as that found inside the Casino. So, I checked out the weekly Revenues report for Rivers Casino that went online yesterday, Friday June 1st. However, as you can see by clicking on the image to the left of this paragraph, last week Rivers Casino at Mohawk Harbor had its worst week for gaming revenues since the end of March, with a total GGR of $2,876,146 for the week ending Sunday May 27, 2018. 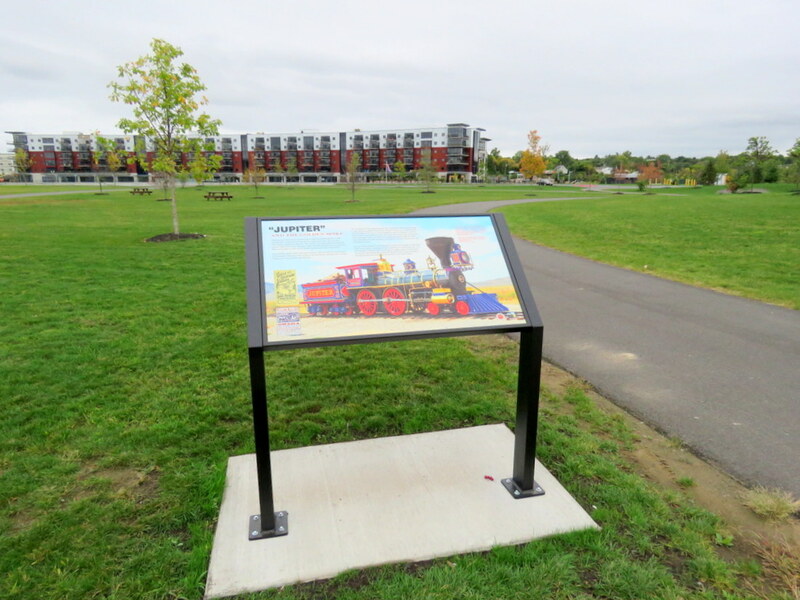 If you have not spent time on the greener side of Mohawk Harbor, you might enjoy this Slideshow, which has photos taken May 28, 29 and 30, 2018. */According to the AAA, the draw of gambling made Las Vegas NV the 4th most chosen destination for Memorial Day Weekend. 2018. Gambling hubs such as Denver and Phoenix were also in the top ten destinations list for the holiday weekend. 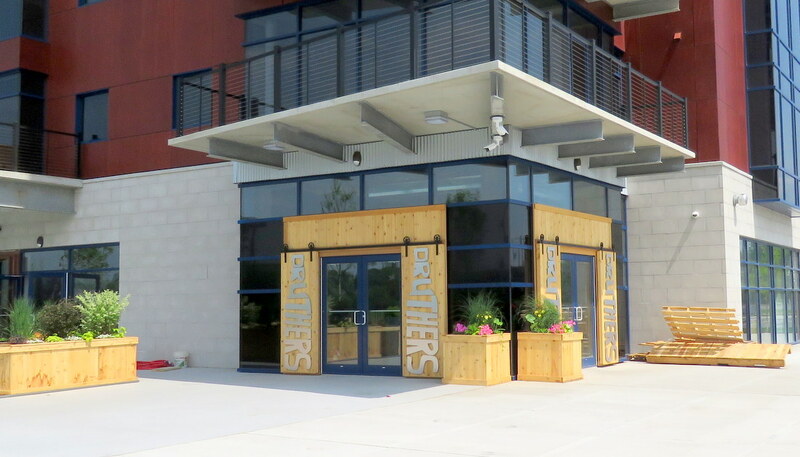 coming in June, Druther’s at River House . . This morning, the U.S. Supreme Court overturned the federal Professional and Amateur Sports Protection Act, which dates back to 1992, and is known as PASPA. PAPSA prohibited most States, including NJ and NY, from allowing sports betting. For a good analysis of the decision (understandable for the non-lawyer) see the premier weblog covering the Supreme Court, SCOTUSblog, “Opinion Analysis: Justices strike down federal sports gambling law“. The Court decision is called Murphy [as Governor of New Jersey] v. NCAA; click here for a pdf. version of the full opinion. Under the current gaming law, only full casinos may offer sports betting once it is legal under federal law. They must get a specific license for that. 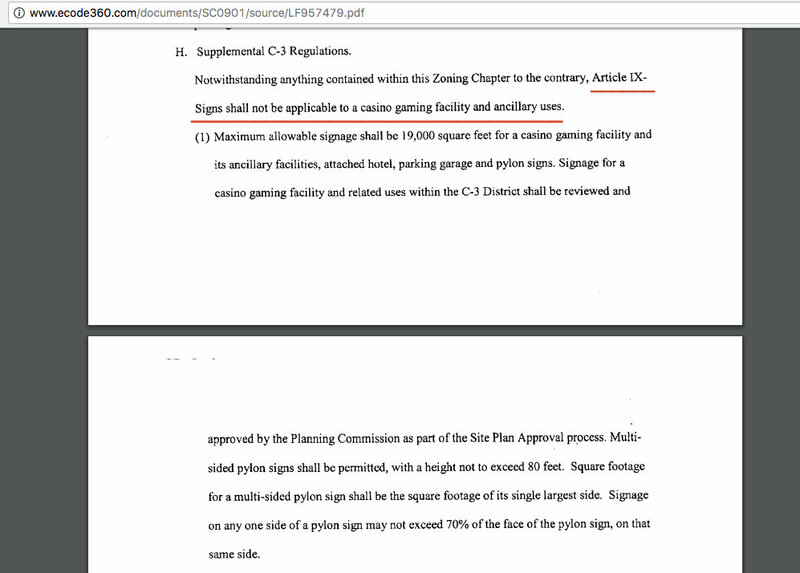 “Racinos”, such as the Saratoga Casino, already have let it be known that they want a law letting them do it, too. Under the current NYS Gaming Law, slot machine revenues at Rivers Casino are taxed at a 45% rate, and any other type of gaming revenues are taxed at 10%. And, according to the Times Union, “State Senate Racing, Gaming and Wagering Committee Chair John Bonacic carries legislation that would . . . impose a state tax of 8.5 percent on sports wagering gross revenue.” So, if Rivers Casino slots players move a significant amount of their money over to the Casino’s Sports Betting lounge, or another Sports Wagering location (including online offerings), tax revenues from Rivers may decline, despite more betting go on at the Casino. Naturally, Rivers Casino hopes to lure sports bettors into other parts of the Casino, adding to gaming revenues. The state law that allowed commercial live-table casinos in New York included a provision authorizing wagering on sporting events if the federal law was found unconstitutional or changed. Casinos must have a license specifically to offer sports gambling and gambling on sports can only be offered in “lounge” areas at a casino.
. . . Under current law, gambling operators besides the commercial live-table casinos, such as NYRA, the Saratoga Casino Hotel and Capital OTB, would be shut out from offering sports betting. But legislation from Sen. John Bonacic, an Orange County Republican and chair of the state Senate’s racing committee, would allow those operators to act as affiliates to the casinos and offer sports wagering. . . James Featherstonhaugh, a minority owner in Saratoga Casino Hotel, anticipated the state Legislature could begin working on legislation addressing sports gambling this week. “I would expect it to be a lively topic between now and the end of the legislative session,” he said. ” The state Gaming Commission must also adopt regulations and issue a sports gambling license before the casinos could offer sports wagering. That process will likely be preempted by the state Legislature and Gov. Andrew M. Cuomo. . .Cuomo, speaking to reporters in Manhattan on Monday, rejected the idea that sports gambling in New York could be rolled out using the broad framework crafted in 2013. He said a new law was needed if the state wanted to proceed with sports gambling.” “We’ll do an economic analysis and a legal analysis, but nothing’s going to happen this year because there’s literally just a number of days left in the legislative session and this would be a very, very big issue to tackle,” Cuomo said. The only local player with the potential to offer sports gambling under current law is the Rivers Casino & Resort in Schenectady, which has been eagerly preparing for the Supreme Court decision, according to their parent company, Rush Street Gaming.”We look forward to adding sports betting across all our gaming platforms as soon as possible,” Rush Street Gaming CEO Greg Carlin said in a statement. State Senate Racing, Gaming and Wagering Committee Chair John Bonacic carries legislation that would allow for sports gambling on online platforms, impose a state tax of 8.5 percent on sports wagering gross revenue, collect fees for the operators of sports leagues, and authorize gambling on college sports. [Comment by David Giacalone:] Mayor McCarthy is already counting chickens early and praying for golden eggs. If enough slots betting (taxed at 45%) is instead bet on sports (taxed at 5 or 8.5 or 10%), taxes paid by Rivers Casino to the State may amount to a lot less than expected, even if Rivers revenues rise. Grandpa and Uncle Joe might just head for the Sports Wagering Lounge at Rivers, leaving Grandma and Aunt Tillie at the slots; or, all four of them might decide that sports wagering can be a lot more stimulating than a slots trance. As a result, former slots players might generate a lot less tax revenue even though visiting Rivers Casino as often as before. I know why Rivers Casino wants to start sports wagering ASAP, but I am not so sure why the Mayor of Schenectady is in such a big hurry. In a related matter, in case you missed the news, as of May 4, 2018, Capital OTB now has a branch inside Van Slyck’s Bar at Rivers Casino. update (July 17, 2018): David Lombardo of the Times Union Capitol Confidential Blog posted a piece yesterday afternoon titled “State looks to offer online sports gambling without new law” (July 16, 2018). That position by the State Gaming Commission is contrary to Gov. Andrew Cuomo’s stated preference in May. 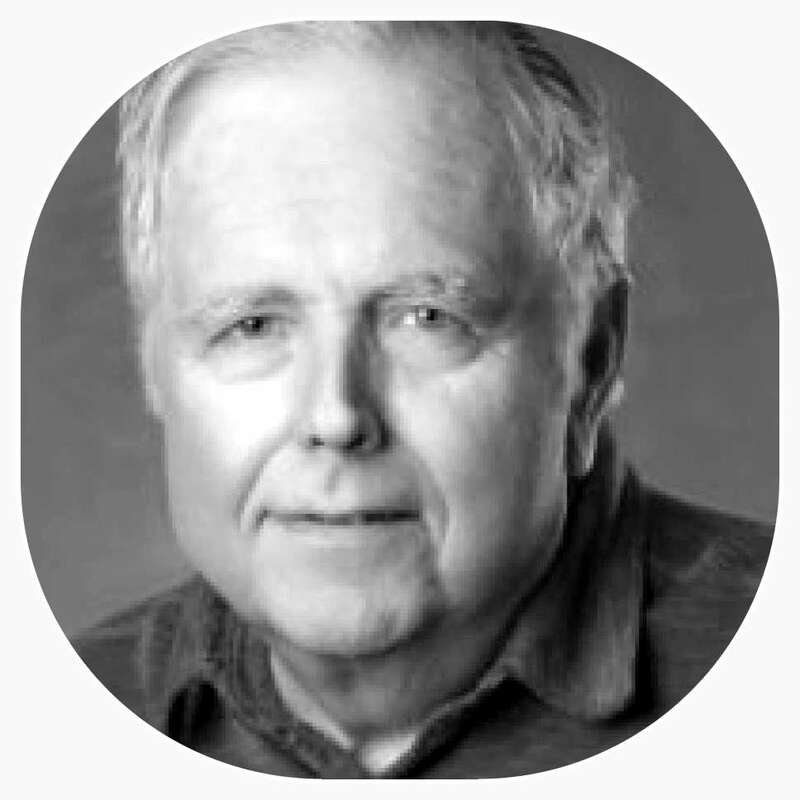 Commission acting-Executive Director Ron Ochrym said to the board. “There are however, a number of thorny policy [areas] that staff have been considering, including whether the existing law can be read so as to authorize mobile wagering without new statutory enactments, and, if so, whether to limit the number of skins available.” The TU blog notes that the State law reads: “An operator shall accept wagers on sports events only from persons physically present in the sports wagering lounge”. And see, “New York preps limited rollout of sports betting” (Times Union, August 8, 2018, by David Lombardo). “The state Gaming Commission is working on regulations that would make sports gambling available at New York’s four privately run full-scale casinos, including Rivers Casino & Resort in Schenectady. Today’s ruling could also have a much broader reach, potentially affecting a range of topics that bear little resemblance to sports betting. For example, supporters of so-called “sanctuary cities” – cities that refuse to cooperate with federal immigration officials to enforce immigration laws – have cited the 10th Amendment in recent challenges to the federal government’s efforts to implement conditions on grants for state and local law enforcement. Challenges to the federal government’s recent efforts to enforce federal marijuana laws in states that have legalized the drug for either recreational or medical use may also be based on the 10th Amendment. 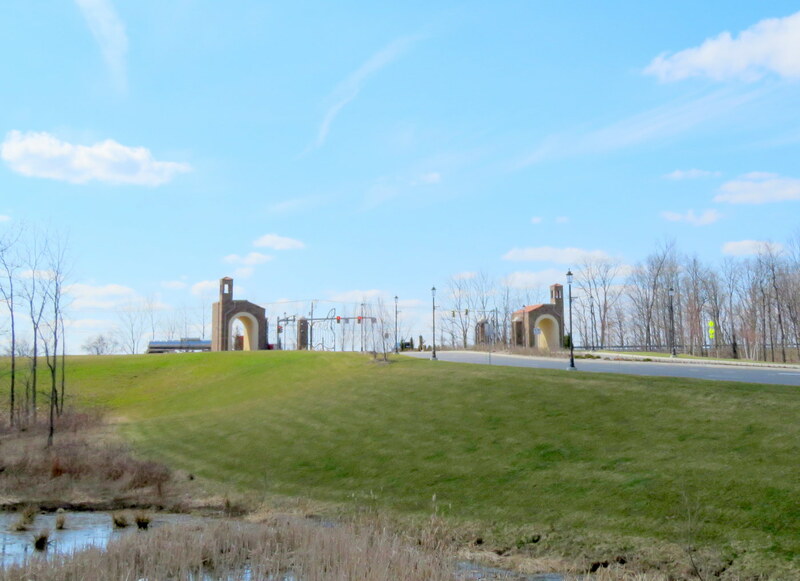 Driving back to Schenectady the day after Easter, I noticed that del Lago Resort & Casino is located right at Exit 41 of the New York Thruway, at Waterloo, NY, in Seneca County. 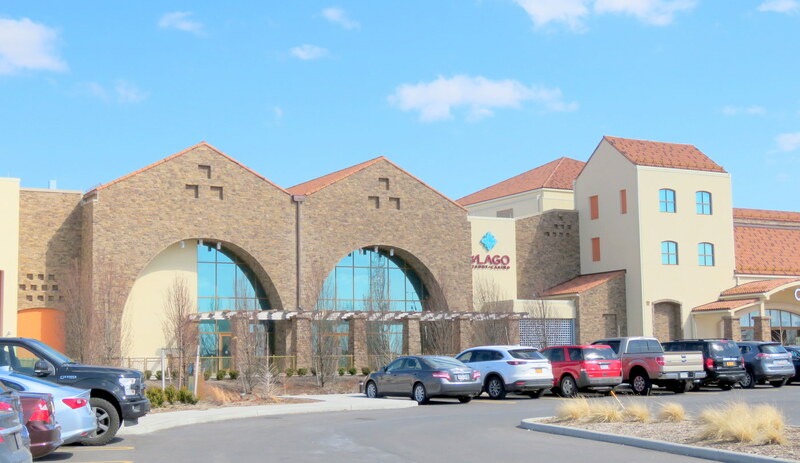 Having only seen renderings of del Lago, when concluding it looked considerably more attractive than Rivers Casino at Mohawk Harbor, I thought I’d take the opportunity to stretch my legs and take a few photos of the exterior of del Lago in the brick-and-mortar world. Data show gambling surges annually in late winter; other casinos also enjoyed strong March revenue” (by John Cropley, April 7, 2018). 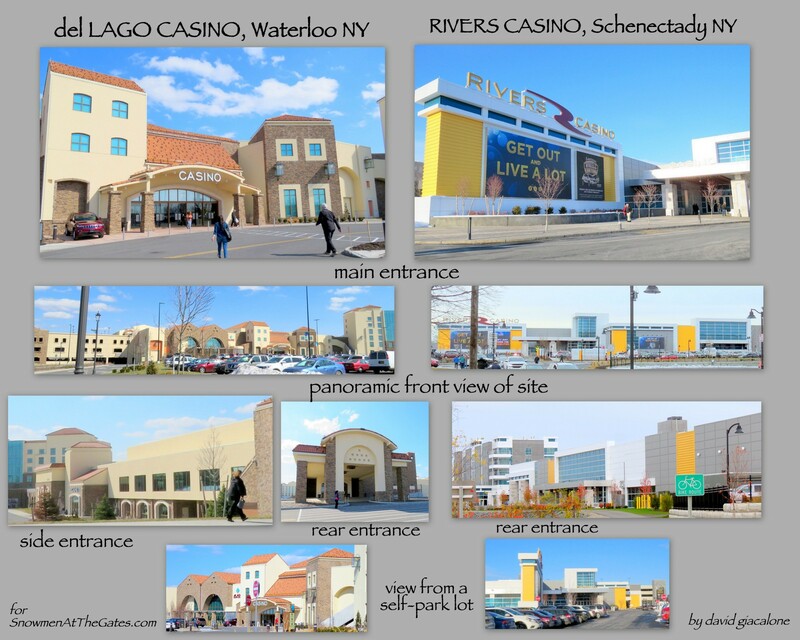 Rivers Casino was never asked by our Mayor to enter into a Host Community Agreement, while del Lago Casino (then known as Lago) entered into a comprehensive HCA with the Town of Tyre, Waterloo, and Seneca County. Distances. 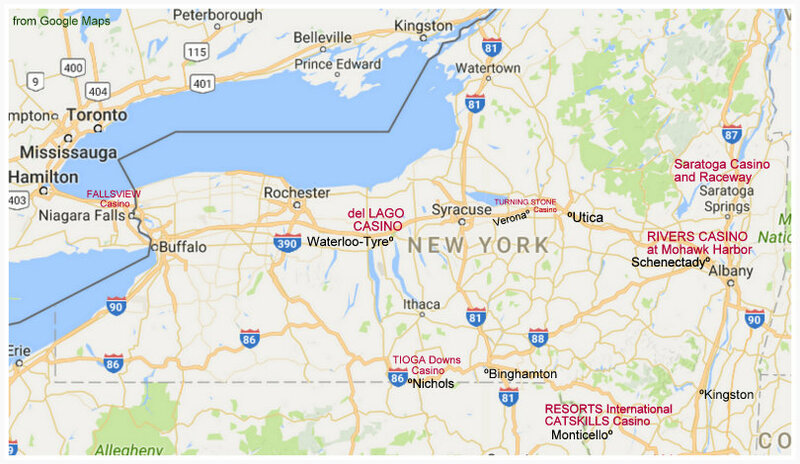 Del Lago is 43 miles from Syracuse, 50 miles from Rochester, 90 miles from Utica, 95 miles from Binghamton, 105 miles from Watertown, 112 mlies from Buffalo, and 156 miles from Schenectady. In an Appendix at the bottom of my Casino Choices posting from January 2017, I have compiled the distances of the various casinos from Albany, Binghamton, Buffalo, Ithaca, Kingston, Rochester, Syracuse, Watertown, and Utica. . . “get dose bums outta here!” . .
Little more than a year since their grand openings, two of New York’s four non-Indian casinos are asking the state for financial help. 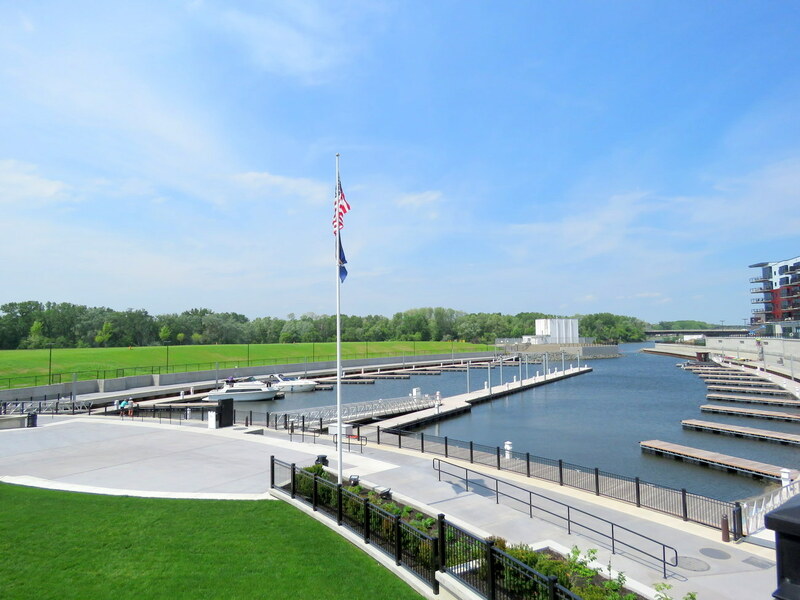 Rivers Casino & Resort in Schenectady and Del Lago Resort and Casino in Seneca County are both making their cases with state lawmakers as the negotiations for the 2018-2019 state budget wind down to the final hours in Albany. Details on their requests are elusive and, given the secretive nature of deal-making in the Capitol, quite possibly subject to change or outright rejection.
. . . Details were likewise hazy on the request by Rivers. A New Jersey public relations agency working for Rivers said there would be no comment on the matter. 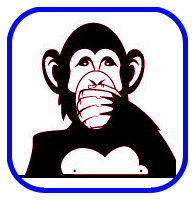 A lobbyist reportedly working for the casinos did not return a call seeking comment.
. . . 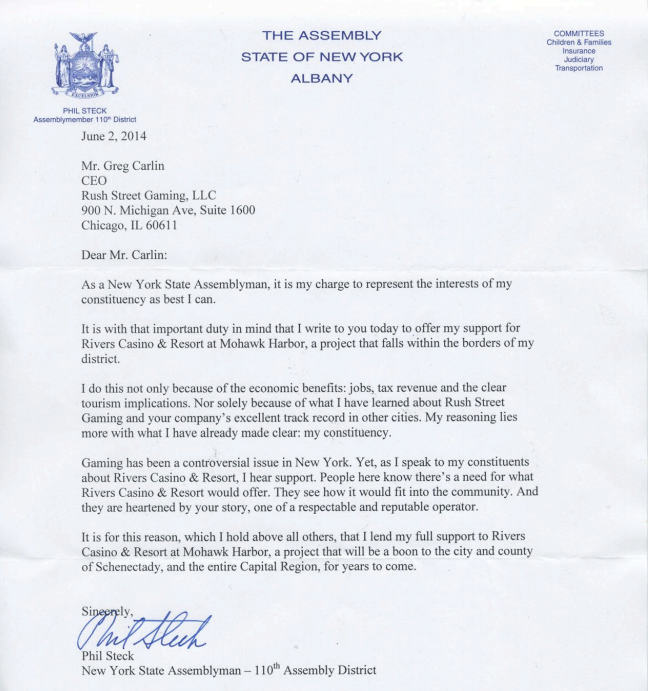 However, Assemblyman Phil Steck, D-Colonie, whose district contains Rivers Casino & Resort, said he has been given a rough idea of what Rivers is requesting, and said he endorses it. 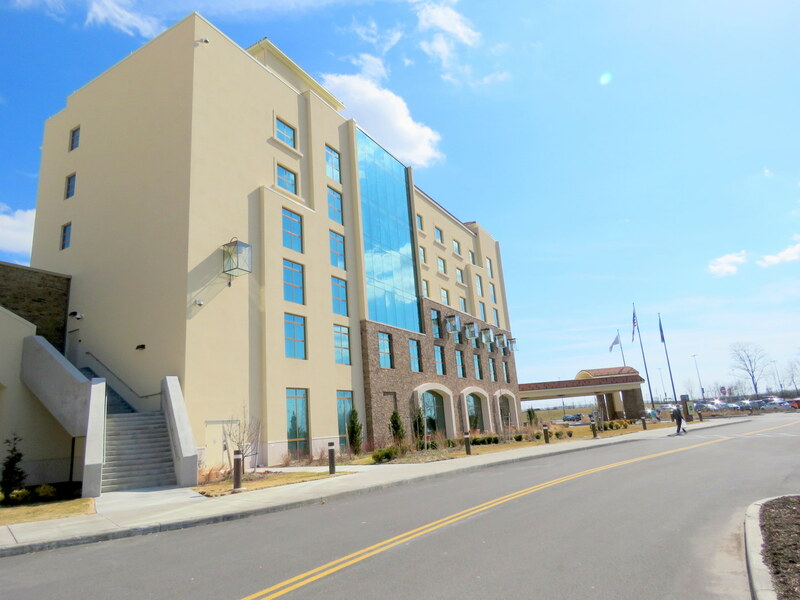 When Rivers hired Rob Long as its new General Manager last December, we also noted that Long had guided the development and opening of Rush Street’s very first casino, Riverwalk in Vicksburg, Mississippi. Rush Street sold that Casino in 2012, just four years after it opened, and after failing in their request for a 60% reduction in their property tax assessment. 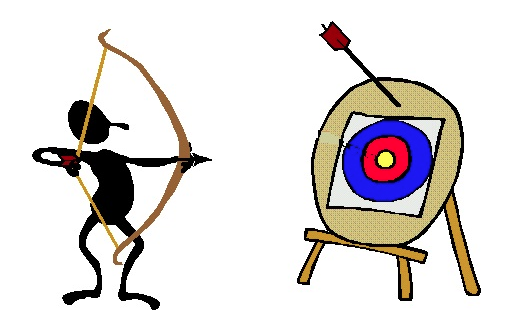 Have Rush Street and Galesi Group drawn up their tax assessment challenges yet? Are they looking for a buyer? What will Mr. Steck do for them next? In addition to checking out https://tinyurl.com/unpromisingCasino, see “casino projections vs. casino reality” and links therein. Stay tuned, and watch out for those pick-pockets and Rushing Bums. update (4 PM, March 28, 2018): See “Cuomo says he is not interested in bailing out casinos” (State Of Politics. March 28, 2918). Article also has letter from State Senator Micheal Ranzenhofer, wanting help for existing casinos hurt by creating del Lago Casino, not for del Lago. [8PM update] See “Cuomo: No bailout for Rivers, del Lago casinos” (Gazette, John Cropley, March 28, 2018). There are many others in this state that aren’t getting what they need and that deserve more money from the state — many others in severe need through no fault of their own. The casinos don’t fall into that category, and state lawmakers shouldn’t cave in to their appeals. 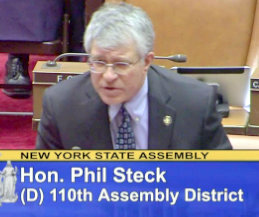 “It’s not saying, ‘State, come in and give us money’; it’s saying, ‘We believe we need to expand the market for our product, we need an allowance for marketing,’ and I think that’s a reasonable position for a business to take,” said Steck, a Democratic lawmaker from Colonie, of the request by the Schenectady casino, which is located on the former Alco site on Erie Boulevard. “What they’re saying is, ‘If we spend 10 cents on marketing instead of giving you 100 cents on that dollar, we’re going to give you 90 cents,’ and that makes a lot of sense because if the total amount of revenue expands as a result of their marketing effort, the state’s going to make more money anyway and so will the city,” Steck said. All the signs were there years ago that the casino expectations and promises, especially upstate, were overblown. Now that those warnings are proving true, these enterprises seem to hope New York will behave like a classic loser who digs deeper into his pockets in the hope of a winning hand. 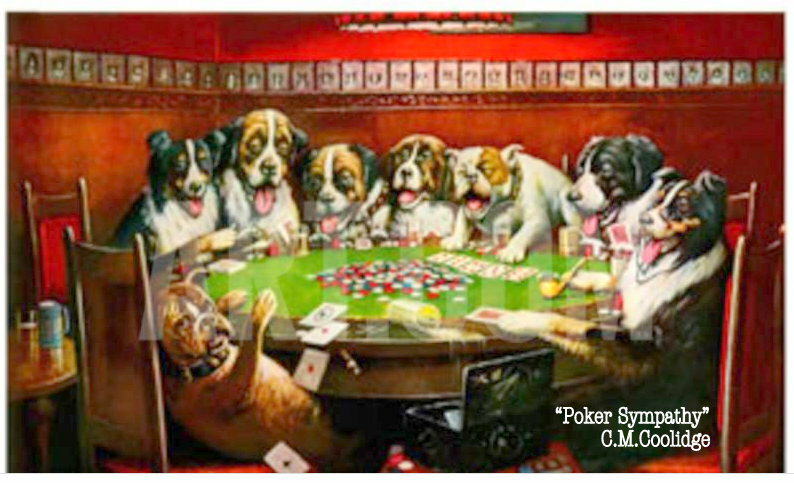 There’s a gambling term state leaders would do well to learn: Pass. Year-end numbers are in for 2017, and the City of Schenectady has received approximately $2.1 million in gaming tax revenue as the Host City of Rivers Casino at Mohawk Harbor, based on the Casino’s Gross Gaming Revenue total of $129.2 million for the year. The County received the same amount. In its budget, the City had projected it would receive $2.75 million from distribution of gaming taxes in 2017, leaving a shortfall over $600,000. See “Schenectady loses bet on casino revenue” (Times Union, by Paul Nelson, Jan. 4, 2018). 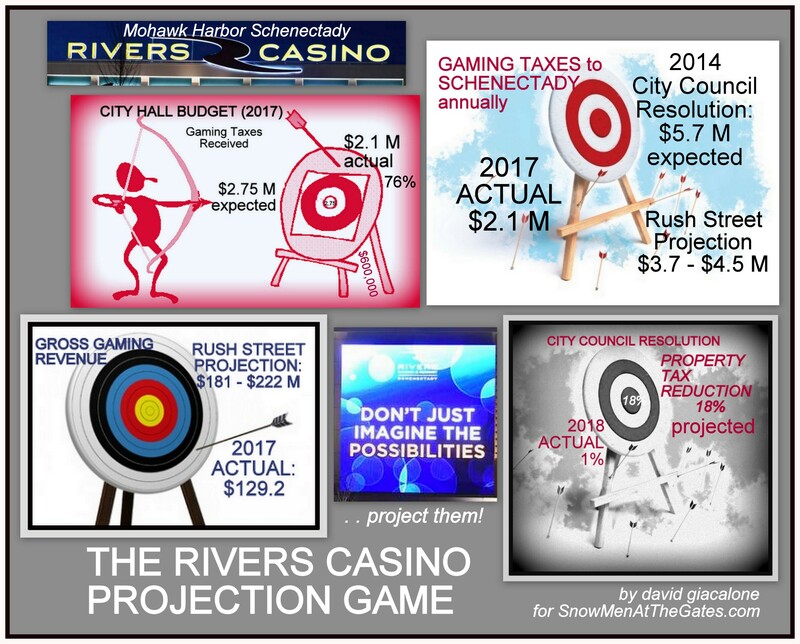 As the Gazette pointed out last November, “Rivers reportedly projected its first-year [Gross Gaming] revenue to be in the $181 million to $222 million range.” If we take the middle of that range, $201 million in GGR in its first year, Rivers Casino only achieved 64% of its first year projection. Click here to see Rush Street’s 5-year tax revenue estimates, submitted in its Application to the Gaming Commission Location Board as Ex. VIII.B.4. It shows a base GGR for 2017 of $201.8 million. Its high and low figures were obtained by respectively adding and subtracting 10% to that figure, yielding the range given in the Gazette of $181-222 million. Because Rush Street anticipated opening on Jan. 1, 2017 when making this estimate, it used a 52-week period rather than the actual 47 weeks, which meant 10% fewer operating weeks/days. Note: In Ex. VIII.B., filed at the end of July 2014, Rush Street Gaming estimated that the County and City would together receive a total of $3.2 million in gaming tax revenues in Year One, increasing to only $3.6 million collectively in Year Five, and would share those amounts. Those numbers are very different from the $5.7 million in annual tax receipts City Council said it expected in its resolution the month before. I would have thought the communication between City Hall and the Casino Gang was better than that. In what is surely a causally related effect, Mayor Gary McCarthy stated for the first time, in his New Year address before City Council last week, that he expected the City would have a “small deficit” when all 2017 numbers were tallied for the City, giving no further details of the cause or the likely amount. Asked afterwards, new City Council President Ed Kosiur said the Mayor’s remarks were the first he heard of a deficit. See “Schenectady Casino Revenue Coming Up Short of Expectations” (Samantha Beckett, Casino.org, Jan. 5, 2018). Regarding the Upstate casino shortfall in general, see “He nailed it: An analyst’s 2014 report predicted Upstate New York casino woes” NYUp.com, by Don Cazentre, Jan. 18, 2018). Click on the image to the left to see a week-by-week display of Gaming Revenues generated at Rivers Casino in 2017, plus totals. The Stabilization Hope. Our City and County leaders keeping saying we can expect much better results once the casino’s operations and revenues have stabilized — as if Rush Street and its expert analysts are not competent to make first-year projections. But, in its Application to the Location Board, Rush Street Gaming estimated stabilized revenues in Year 5 to be only 10% more than its Year 1 figures. For more information on Rush Street’s revenue and tax projections, see the Applicants’ Economic Impact Analysis. Remembering the 18% property tax reduction City Council claimed it expected in a Resolution passed just before its vote to approve the Casino Application in July 2014, many residents are unhappy with the 1% reduction in the current City budget, and many are “roiled” over the water and sewer fee increases announced this week, which will offset the 1% reduction. See “State, local promises before casino vote a bust” (Times Union, by Lauren Stanforth, December 17, 2017); “Water, sewer rate increases roil some Schenectady residents” (Times Union, by Paul Nelson, Jan. 5, 2018). And, did you say “Resorts World Catskills Casino”? a Long-shot at Rivers Casino? 2nd worst total GGR since June [$2,388,276]. 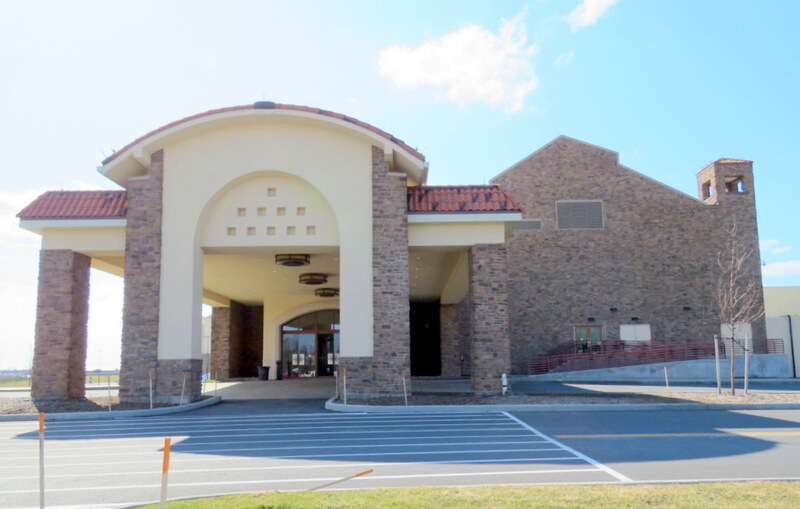 sold their Riverwalk Casino in Vicksburg, Miss., just four years after it opened, and after failing in their immediate request for a 60% reduction in their property tax assessment. it was sold in 2012 to Churchill Downs. By the way, of the 19 Mississippi casinos located along the Mississippi River, Riverwalk was one of the only two facilities that were not forced to close in 2011 due to record flooding. Did Rush Street decide it would not press its luck? 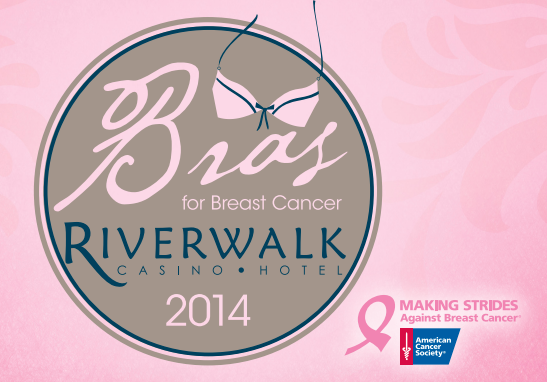 One more thing I did learn, Long’s Riverwalk Casino’s big fundraiser each year was “Bras for Breast Cancer”, which offered to pay a dollar for donated bras and strung the bras across the Old Highway 80 Mississippi River Bridge, with a special section featuring creatively decorated bras. Hey, we have a nearby bridge! 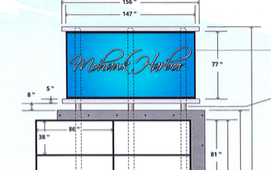 QQ: Rush Street Gaming will not tell us, nor will Rob Long himself, but I sure would like to know what options the company discussed with its GM when planning for the near-future at Rivers Casino in Schenectady. When will they start considering jumping ship along the Mohawk? 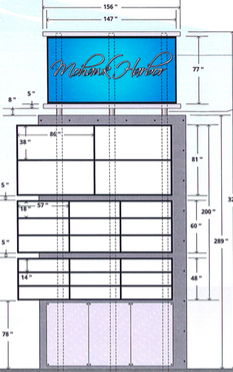 Not to mention, how happy is the landowner, Galesi Group, that they “designed” the Schenectady casino to be just boxes next to boxes, so the facility could easily be converted from a casino to just about anything? According to the NYS Racing Commission revenues page for Rivers Casino, its 38th week (ending October 29, 2017), was the WORST week yet for the Schenectady Mohawk Harbor Casino. 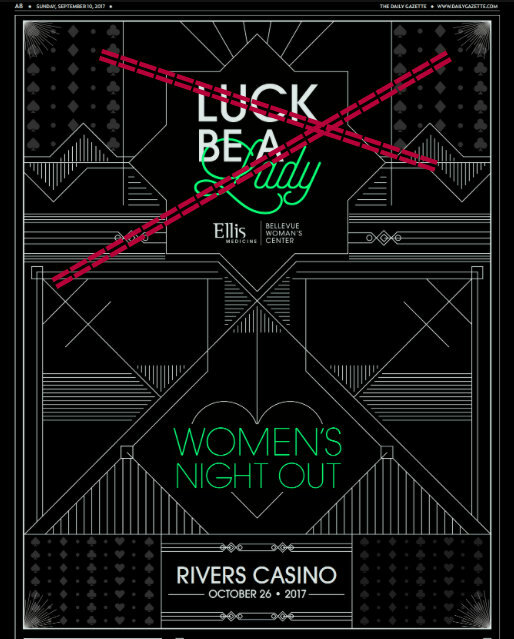 That’s despite having the Ellis Foundation’s big Women’s Night Out “Luck Be a Lady” event there on October 26, preceded by a prep-day of Table Game education in September. Of course, we can only guess the effect of several weeks of Mayor Gary McCarthy appearing in ubiquitous (and, for many of us, tacky and dispiriting) Fuccillo Auto ads shot at the Casino. Nonetheless, last week’s, take, $2,039,456, was perilously close to dipping below the $2-million mark. BODIES. We hope that Foss or another journalist will look into the promises Rush Street made about how many people the Casino would bring to Schenectady. It projected 2.8 million a year. The fact that we have never been given any attendance numbers past the first couple of days suggests that the projected body-count was another cynical exaggeration. See our post, “despite Billy Fuccillo, no HUGE casino revenues yet” (Oct. 8, 2017), tells of a number of factors we were told would lead to higher Rivers Casino revenues after the summer, but have not. Has acted as if Schenectady were a Supplicant, and a Second-Rate City, during the casino license application process, and thereafter, rubber-stamping the Mayor’s Supine Schenectady position, giving the Casino applicants their every wish, while making no demands. 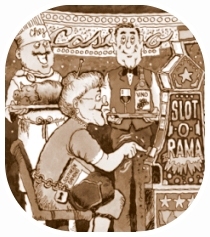 In contrast, all other potential casino locations use their leverage, to assure additional income from the casino, including mitigating its added expenses for infrastructure, public safety, and social problems; seeking guarantees of minimum revenue payments; and demanding local preference for jobs, and a buffer period in which property assessments would not be challenged by the developer. Never questioned any claim made by the Casino applicants prior to voting to approve their Application for a Casino License in Schenectady as to projected revenue and the absence of likely negative effects. Never sought an independent study of potential negative effects and realistic benefits, despite his claims of financial expertise. And, never questioned or challenged any of the drastic changes in our zoning ordinance, demanded by Rush Street Gaming and the Galesi Group. 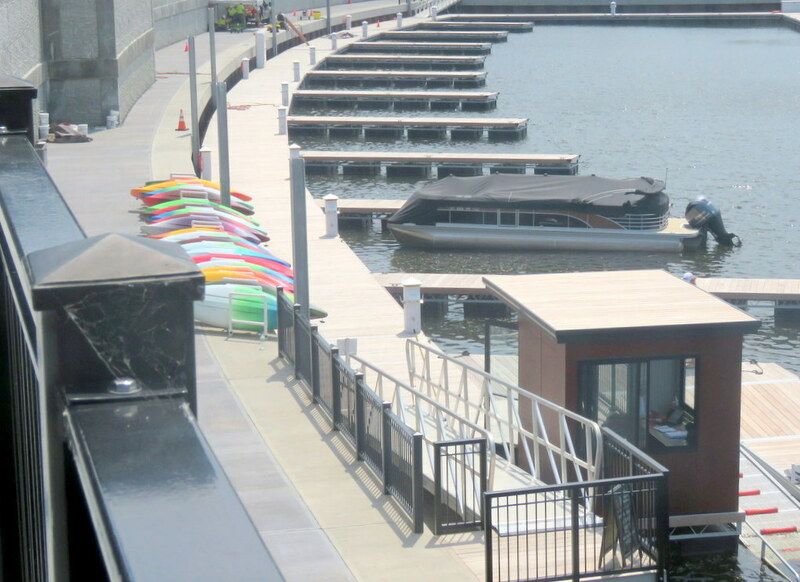 As a result, the Council and the Mayor took away the guarantee of public access in perpetuity to enjoyment of the riverbank when the harbor was developed, and the requirement that 10% of residential boat dock space be reserved during the day for the public. 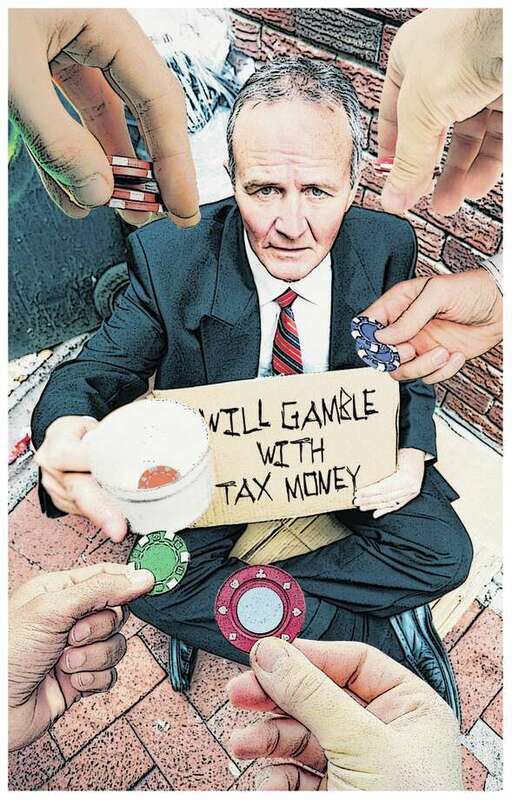 Was a leader in the Stop the Schenectady Casino campaign, pointing out the many problems raised by locating a casino in an urban area and the need to fully consider likely problems and realistic benefits. Demanded over and over, at City Council meetings, and in writing to the press, that the City use its leverage to demand/negotiate the best possible agreement with the Casino to maximize revenues and local employment, and minimize and offset added financial and social costs. Empty Chair. One final note about the two candidates: Mohamed Hafez, a registered Democrat running on the Republican and IndependenceParty lines, attended every candidate forum during the current City Council election campaign. John Mootooveren, the incumbent Democrat who is 1/4th of the Mayor’s 4-person rubberstamp majority on the Council, failed to appear at the League of Women Voters forum, the Gazette Candidate forum at Proctors, the Woodlawn neighborhood association forum, and the Goose Hill Neighborhood Association meet the candidates event. If business continues at its current pace, the city and county would each get a little more than $2 million in gaming money at year’s end. As has been the case from the start, the casino appears poised to fall well short of what was expected by each government entity. In budgeting for 2017, the city and county both used the low-end projection from the casino’s application and pro-rated it to a March opening. That leaves each government expecting about $2.75 million in gaming revenue for 2017. Gaming revenue is expected to stabilize by 2019. Of course, we need to ask: “Stabilize” at what level? And, we might also ask what Schenectady County spokesman Joe McQueen means when he says that “thanks to the infusion of casino money, . .the county is now expecting to see about $855,000 in annual savings.” Is this figure based on some sort of “netting out” of revenues received due to added expenses and reduced receipts from other sources, such as sales or property taxes because of the Casino’s Substitution Effect? Greater negative financial impact on nearby businesses – the good numbers go down. 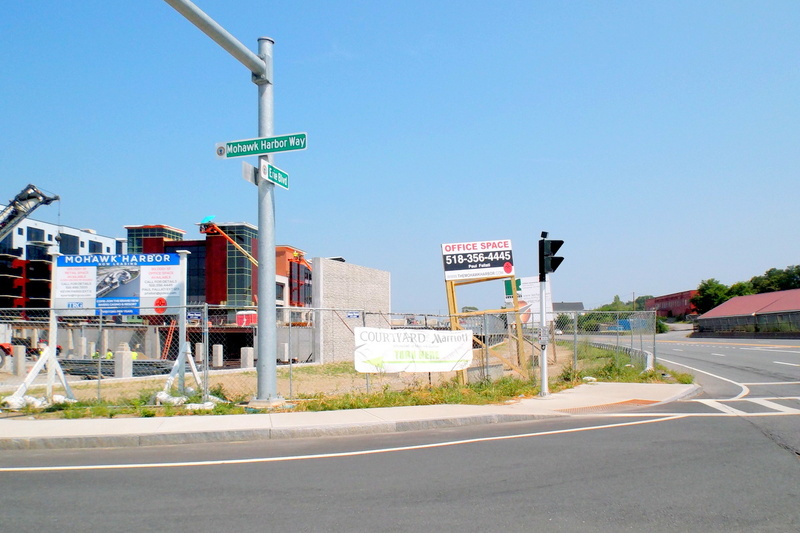 Studies show that property values near a casino decrease by 10% or more once the casino opens. Part of the reason for that is because the casino never closes. It operates 24/7. Commercial buildings, apartment buildings, condominiums, etc. decrease in value which means over time they pay lower property taxes. Research also shows that 60% of businesses that existed before the casino opens, go out of business within 2 years of the casino opening. Lost jobs. Lost taxes. Failed entrepreneurs. Empty storefronts. It may be too early for such effects to be apparent in Schenectady, but we need to be vigilant when speaking about how much the Casino has enhanced our tax coffers. Lucky Coincidence? Just as the Schenectady Gazette ran an editorial urging that we “Give it more time for revenue from Rivers Casino” (July 17, 2017), Schenectady’s Casino was ending its best week ever for Gross Gambling Revenue. 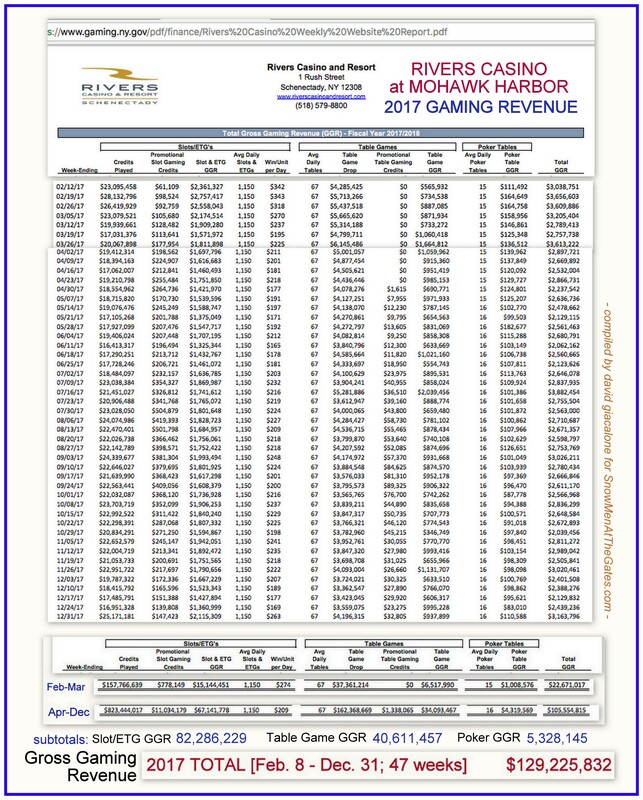 The week ending July 16, 2017, its 23rd week in business at Mohawk Harbor, saw GGR of $3,882,454. That is the best week since its first full week in business back in February. Oddly, although the take last week was up 36.8% from a relatively good prior week, both Slots GGR and Poker Table GGR were down. All of the impressive increase came from Table Games, which had a GGR of $2,039,456. 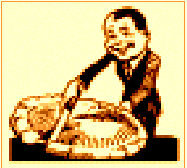 It was the first time Table Game gross gambling revenue was over two million dollars. Did a party of high-rollers (maybe the Bluhm Clan in town for the Casino’s Hotel opening) show up last week to let the good times roll? Or, did Billy Fuccillo show up to throw a huuuge party at the craps tables? 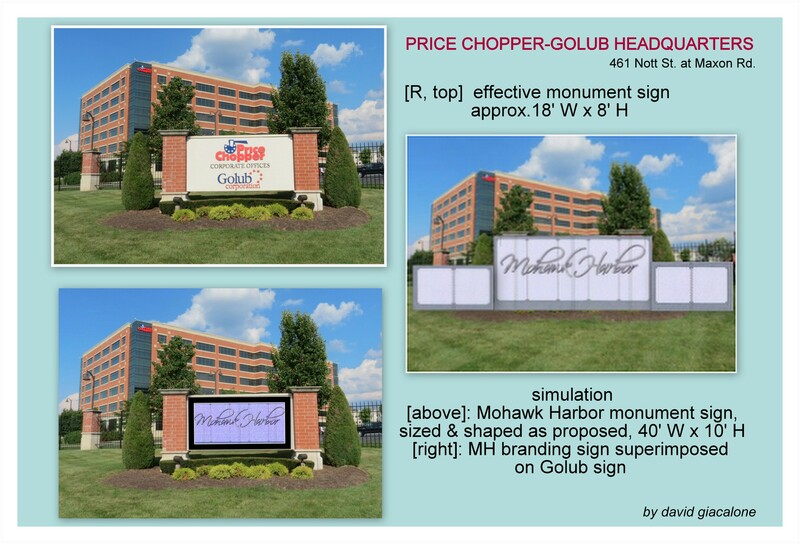 Whatever the reason, after giving space to the many poor GGR weeks at Rivers Casino at Mohawk Harbor, I thought we should spotlight today it oddly good news. I’m not sure, however, if even six more months of weeks like Week 23 would meet Rush Street’s happy projections or even the County’s sober first-year hopes. When it comes to gaming the political system for tax breaks and special perks, it’s hard to beat the gaming industry. In New York State, there are different rules and tax rates for its full-blown casinos, video-gaming racinos, and Indian casinos. Such factors help complicate the casino industry’s tax-gaming game, making for increased melodrama, campaign contributions, and lobbyist income. Two harness racing tracks that host electronic casino operations are looking to the state for help amid increased competition from the proliferation of casinos across upstate New York. One piece of legislation would allow Saratoga Casino Hotel in Saratoga Springs to use 4 percent of its net win for capital improvements. Another would increase the percentage of the net win retained by Vernon Downs Casino Hotel in Vernon, near Utica.. . . Both bills have been approved by the state Senate but have been sitting in committee in the state Assembly. The 2017 legislative session is scheduled to end Wenesday. update (August 23, 2017): see the Gazette article “Saratoga racino gets relief as competition heats up” (by Ned Campbell, Aug. 22, 2017). In response to this year’s crop of Gaming Groveling and Gambits, the Times Union published a Sunday editorial, “No subsidies for the casinos” (premium online content). Citing financial problems, an upstate gaming venue seeks a tax break. Taxpayers should not have to support cash cows that morph into albatrosses. 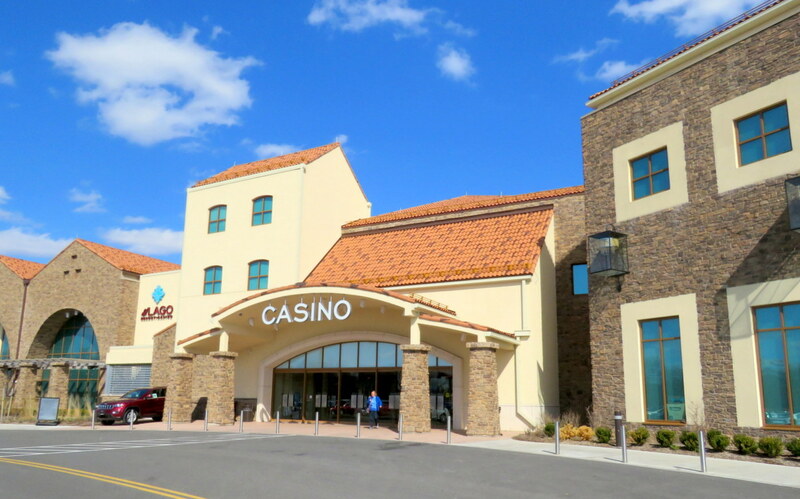 As soon as Rush Street opened Riverwalk Casino in Vicksburg, Mississippi, it fought to have its property assessment reduced from $78 million to $30 million. Almost as soon as they opened Rivers Casino in Pittsburgh, they began lobbying to have their property assessment HALVED, and have continued to do it every single year. The city of Philadelphia also was involved in a legal dispute with Sugarhouse Casino over property tax. 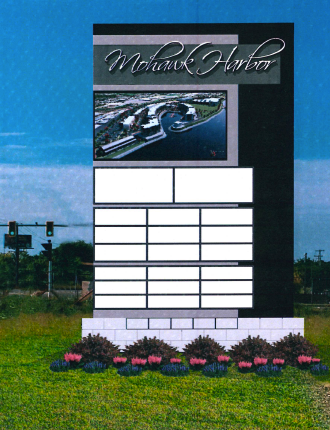 As we reported here when arguing against naming the primary road into Mohawk Harbor “Rush Street,” after failing in their campaign to achieve the 60% reduction in their property tax assessment they had sought in Vicksburg, Mississippi, Rush Street sold their Riverwalk Casino, in 2012, just four years after it opened. The owners of the wildly successful Rivers Casino in Des Plaines have received more than $4 million in property tax cuts since opening nearly five years ago, by aggressively arguing that the property was worth tens of millions of dollars less than it cost to buy and build on. Since 2012, Rivers has reported annual revenues of more than $400 million, after winnings, state records show. Its revenues are twice as large as any of the other nine Illinois casinos. Despite their success, the Rivers owners claim the value of the casino and parking garage has declined, justifying tax relief. . . .
Tellingly, several successive reductions by the elected Cook County Review Board (from $104 M to $88 M each year) “is not enough” for Rivers Casino in Des Plaines: “The owners have gone to court seeking refunds of taxes paid in three previous years, arguing the assessments are still too high.” Rush Street’s primary owner Neil Bluhm is a well-known contributor and “bundler” in the Democratic Party. Although he did not donate to the Cook County’s elected Board members, his tax attorneys and appraisal firms have given substantial amounts. Whatever the case, the casino’s gain is their neighbors’ loss. Home owners and other property owners in Des Plaines and some surrounding communities have to pick up the slack to fund budgets for local schools, parks and other local government expenses to make up for the Rivers tax cuts. Beyond property assessments, Rush Street Gaming is definitely not shy about efforts to change the rules in place when it received its casino license. For example, it has tried strenuously to fend off competition to its successful SugarHouse Casino from a second Philadelphia casino, although the State Legislature had for many years envisioned the second casino. First, it said the State Racing Commission could not re-issue the license after the first licensee failed to get necessary funding. That stalled the competition for years, before the argument was rejected by the State Supreme Court. “Pa. High Court Affirms Propriety of 2nd Philly Casino License” (Law360.ocm, by Alex Wolf). Nonetheless, SugarHouse’s lawyers have raised other issues in court, which have stalled the large South Philadelphia casino project even further. See “Whatever happened with that South Philly casino?” (Billpenn.com, by Anna Orso, Jan. 6, 2017). 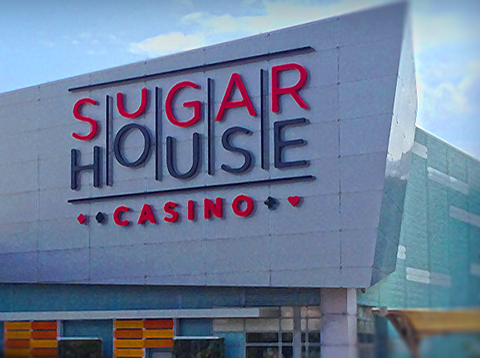 Expectations are that SugarHouse and the other plaintiffs will lose again, but its Rush Street owners have “won” several years of added profits by operating as the only casino in that big town. 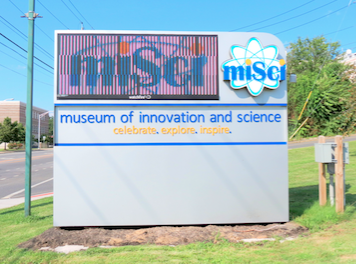 From Cash Cow to Cow Chips, Are they Too Important to Let Fail in Schenectady? Should Rivers Casino Schenectady start to seem more like a Cow Chip Factory than a Cash Cow, you can count on the local leaders who bet their reputations on the Mohawk Harbor casino to help in efforts at the State and local level to seek subsidies of various kinds to alleviate Mr. Bluhm’s suffering. It would be an amusing drama to watch, if it weren’t so important (and predictable). Stay tuned. (update: June 23, 2017): Rivers Casino in Schenectady set yet another new low for revenue generation in the week ending June 11, 2017, its 18th week in operation at Mohawk Harbor. Its net revenues were $2,062,162, down 23% from the prior week, and almost $100K below its previous low-point. 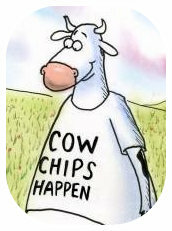 . . is our favorite Cash Cow becoming a Cow Chip factory? Of course, this is the same Casino that keeps telling us how satisfied it is with revenues and attendance so far, despite averaging far below, and never yet meeting, the weekly average GRR it needs to make the lowered expectations it projected for its first year in operation. Despite good media coverage and optimism for River Casino’s roll-out of daily Poker Tournaments last week (see Times Union & Gazette), Schenectady’s Mohawk Harbor Casino posted record-low weekly revenue numbers for the second week in a row, with generated dollars down for the 7th time in 8 weeks. Total GGR for the week ending April 16, 2017 was merely $2,532,004, down 5.2% from the prior week’s nadir. 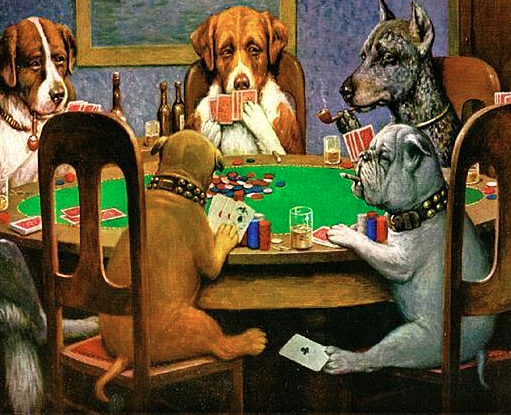 Indeed, its Poker Table GRR during its first week of daily tournaments went down 12.9% from the prior week. And, slots GRR tumbled another 9.7%. Meanwhile, Capital Region competitor, Saratoga Casino and Hotel saw a 6.0% drop from its prior week’s Net Win numbers. For Rivers, it’s the lowest weekly revenue figure since its opening in early February, and it came despite a series of poker tournaments during the week. 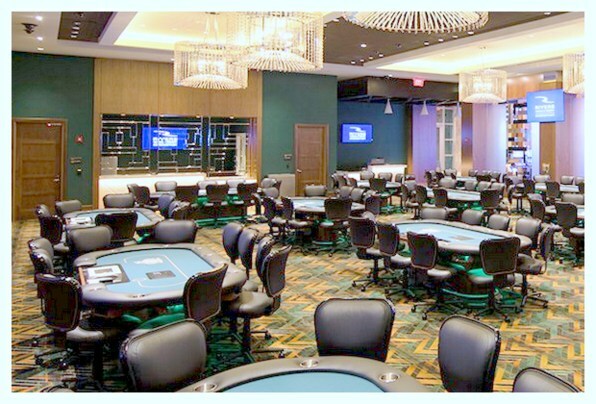 The poker room has been popular among casino customers, officials have said. Observers have suggested that extensive roadwork on Erie Boulevard outside the casino may have played a part in the decline. . . . The casinos haven’t released attendance figures, so it’s not clear how the restaurant and other food outlets have performed. follow-up (April 28, 2017): Finally some good news for Rivers Casino Schenectady and those counting on its revenue stream. For the week ending April 23, 2017, GGR were $2,866,673, up 11.6% from last week’s lowest-ever figures. See the Official Weekly Report. A screen shot of the April numbers is immediately below this blurb. The Net Win figures up the road at Saratoga Casino were up 3.9%. Rivers also reported its Revenue Tax distributions for February 2017, showing that Schenectady County and the City of Schenectady each received $191,991 as their home community share of revenues paid to the State. The average daily GRR for the opening weeks in February were, however, significantly higher than the daily average since then. Nonetheless, the payment of $191,991 for the 22-day partial month of February would result in an annualized total of $3,185,305. When selling the Schenectady Casino to the Racing Commission and the public, Rush Street (and Mayor Gary McCarthy) projected payment of $4.1 million each (22% more) to the City and the County once revenues stabilized. The real news is not that — OMG!! — revenues for a 31-day month were higher than for a 20-day month, but that revenues have been down five of the past six weeks. In fact, the decline last week was 19.8%, while Saratoga Casino had about a 2% increase. If the current pace of just over $200,000 per month continues, the city and county would take in about $2.3 million for 2017, falling well short of Rush Street Gaming’s projections submitted in its 2014 application with the Gaming Commission. . .
That economic impact analysis, which included five-year projections for gaming revenues, estimated the low-end gaming revenue for the city and county would be about $3.3 million each for the city and county. In preparing its 2017 budget, Schenectady County used the low-end revenue estimate, $3.3 million, and pro-rated it to a March opening. 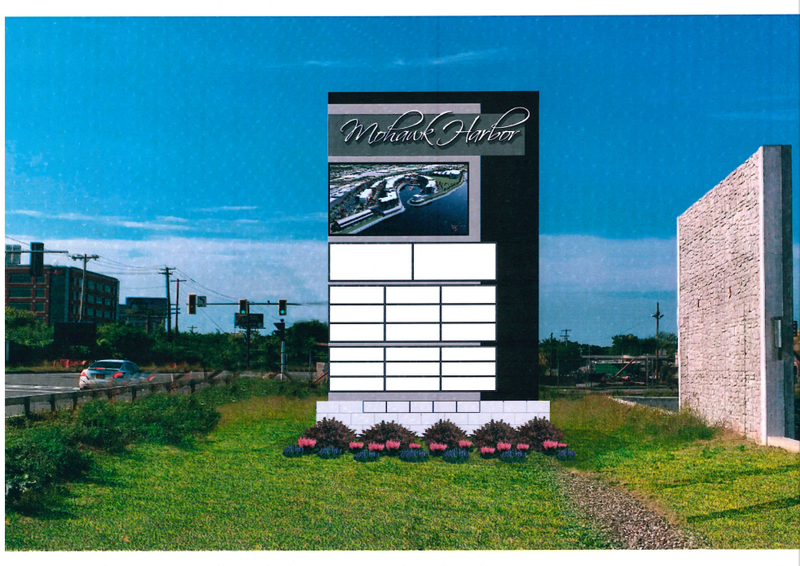 That would leave the county expecting about $2.75 million in casino revenue this year. why the 21-year-old rule at Rivers Casino? 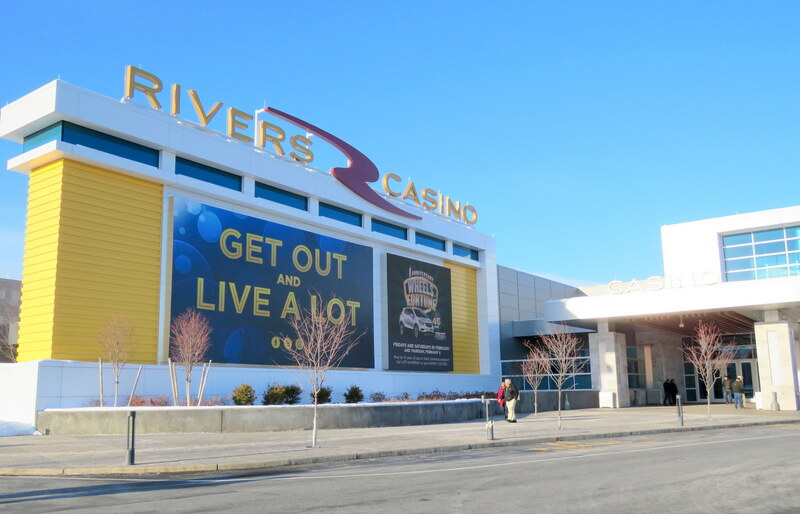 A number of people have left comments in the media this week, after learning that Rivers Casino at Mohawk Harbor was fined for allowing an underaged person — someone not yet 21 — to gamble. They wondered why the age for gambling at the casino isn’t 18, like at racinos and Indian casinos in the State. See “Underage gambler caught — but only after he won $1,300 on slot machines: Schenectady casino fined for letting him on the gambling floor” (Albany Times Union, by Paul Nelson, March 24, 2017); “State fines Rivers Casino $6k for underage-gambler” (Schenectady Daily Gazette, by Steven Cook, March 23, 2017). Any winnings by a person prohibited under the above section must be forfeited and put into the State’s gaming revenues fund. Those under 21 are still allowed in other parts of the casino facility (restaurants, entertainment events, etc. ), but not the actual “casino” rooms where the gambling is allowed. 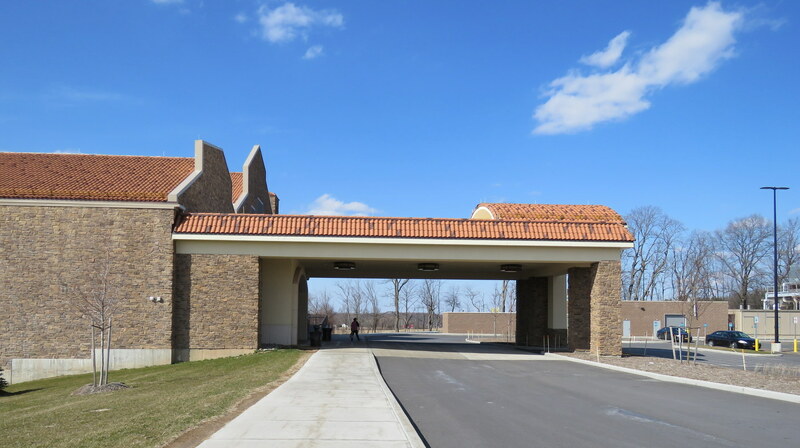 “Racino” locations and Indian reservations may continue to allow 18 year-olds to gamble. Such facilities either send them into special under-21 areas or give them wristbands indicating they are under 21, so they won’t be served alcohol. Attempts by lawmakers and others to raise the gambling age at the racinos have gone nowhere in the State Legislature. Like many laws that seem illogical, the 21-age limit was probably a political concession to get the Constitutional Amendment and the 2013 Act passed. My guess is that the existing racino locations (which do not have live table games) pressed hard to have this advantage over the new commercial casinos; it might also have been a way to get the votes of others who were anti-gambling in general. Schenectady’s Rivers Casino at Mohawk Harbor faced its first major snow storm last week. The storm virtually closed the City down on Tuesday, March 14, but roads were serviceable the next day, with the nearby Stockade neighborhood (especially Front Street, which borders the casino complex) enjoying its quickest snow removal experience in memory. 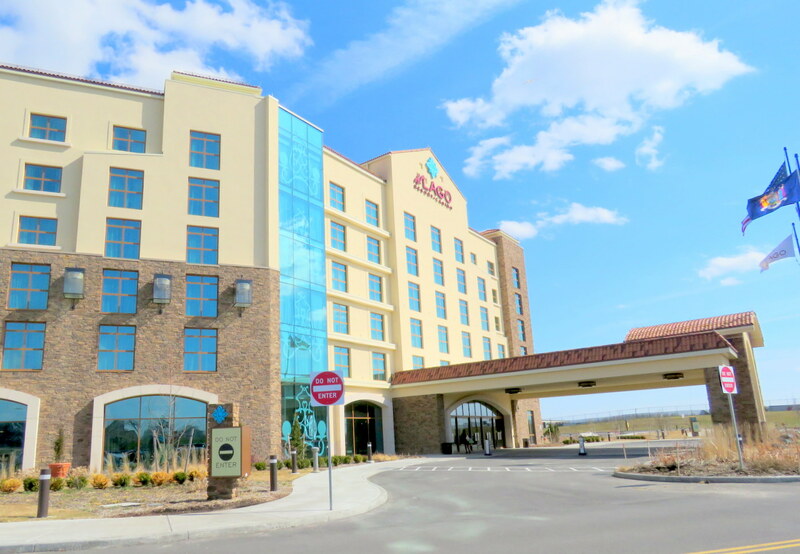 It is no surprise that Gross Gaming Revenues at Rivers Schenectady declined from the prior week’s record low figures, making it four straight weeks of falling GGR. In fact, the 1% reduction was less severe than I had expected, with $2,757,738 generated. The image at the head of this paragraph shows the weekly totals since Rivers opened in Schenectady on February 8. Did grandma decide to stay home, while the high-rollers were snowed in at Mohawk Harbor overnight the day of the storm? update (Monday, March 27, 2017): As of 1 PM today, the Gazette continues to avoid mentioning this streak of weekly revenue declines. Thankfully, the Times Union did report the revenue picture today, in “Area casinos had another down week” (by Eric Anderson, online on March 27, 2017). The TU notes that Saratoga Casino saw its third weekly decline, and “Rivers reported its fourth consecutive weekly decline”, noting “The most recent figures likely were depressed by a massive snowstorm that struck the Capital Region March 14.” TU also explained that even Rivers Casino’s best week so far does not meet the weekly average it would need to make their “stabilized” 2019 revenues projection. 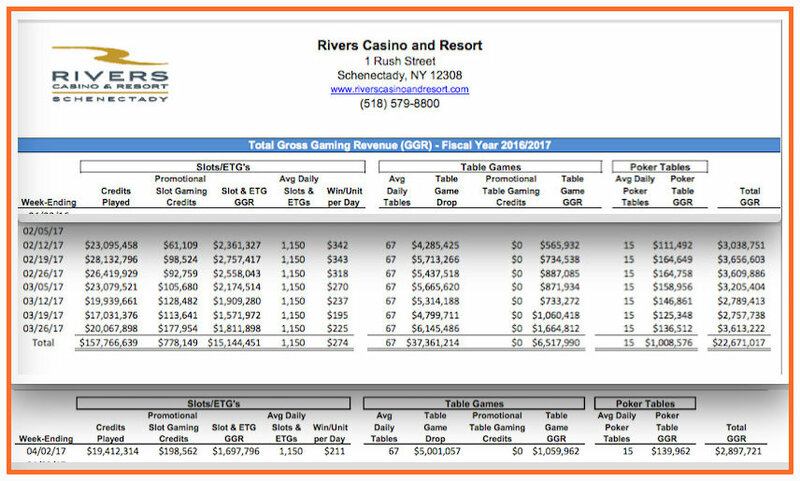 update (March 31, 2017): For the week ending March 26, 2017, Schenectady’s Rivers Casino had its first increase in revenues in over a month. The total GRR, $3,613, 222, was the best take for the Casino since its first full week, with a 31% increase over the prior week’s dismal GRR, which was the Casino’s lowest ever. As you can see from the composite below of the Rivers Casino Total Gross Gaming Revenues Report, there were significant increases in slots (16%) and table games (57%! ), with poker revenues up almost 9%. 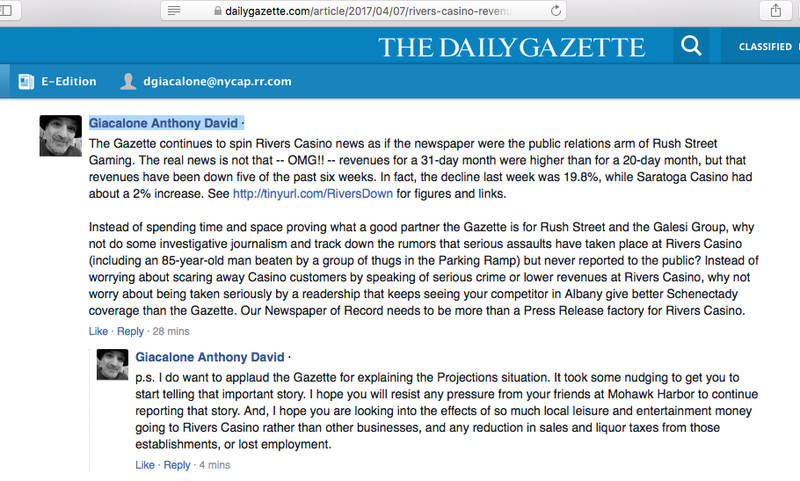 As expected, the Schenectady Gazette never reported that Rivers Casino had four straight weeks of GRR decline, but I’m betting this increase will be up soon at their website and in Saturday’s hardcopy newspaper. p.s. 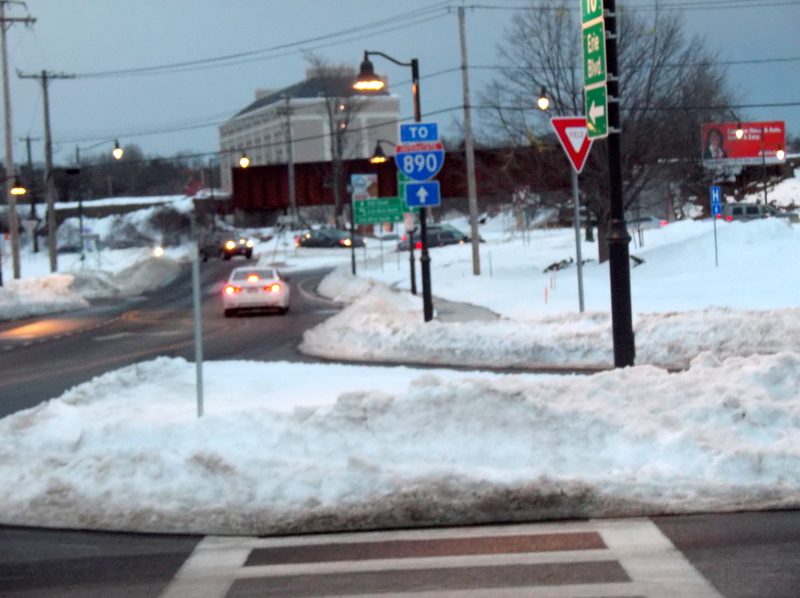 “Walkable Schenectady”? Our Mayor likes to brag about our “walkable City”, as do the gents at Metroplex. A week after the mid-March snow storm ended, many crosswalks in downtown Schenectady were clogged at the curb with snow, and many sidewalks in downtown Schenectady were left unshoveled. 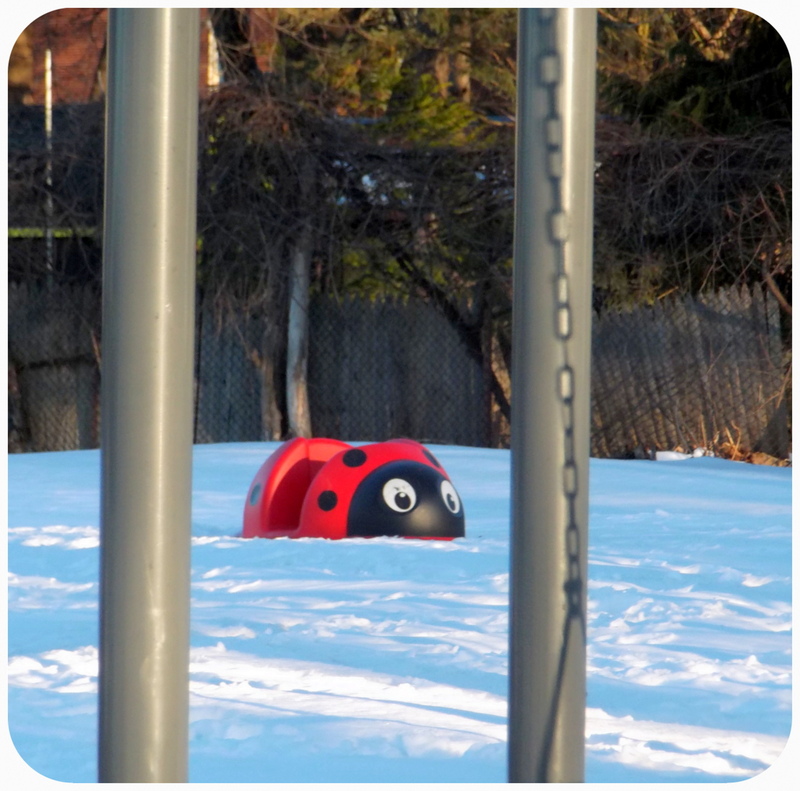 The snow had stopped Wednesday morning, but on Saturday evening, March 18, I made the mistake of trying to walk from my Stockade home up Front Street, to Mohawk Harbor and then up Erie Blvd. I spent a lot of time precariously switching from sidewalk to street. Front St. at N. Church. . I was particularly surprised at how difficult it was to be on foot near the Casino. . . [L] this is what confronted you on foot at the intersection of Front Street and Rush Street, if you wanted to head toward Erie Boulevard. 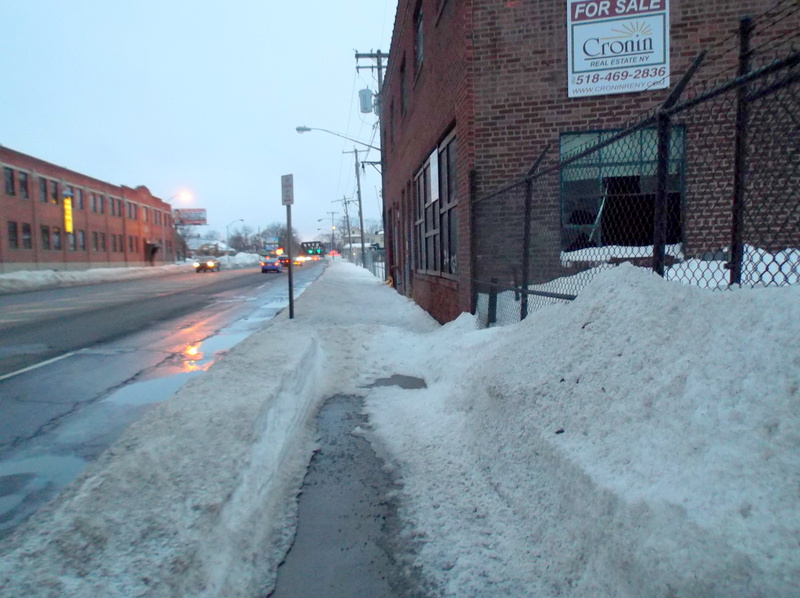 . . . . Once at the rotary at Rush St. and Erie Blvd., you had some snow climbing to do to get to the Nott St. side of the rotary, with an unshovelled sidewalk once across the street. . . [L] Most daunting was trying to head south on Erie Boulevard on foot. 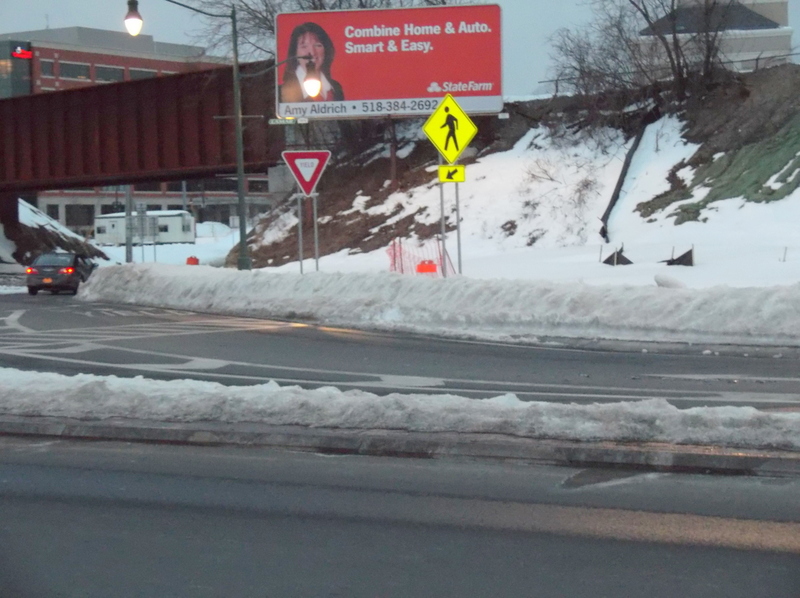 Once past the overhead walkway, virtually all of the sidewalk had the full 19 inches of snow, all the way to Stewart’s, at Green Street. 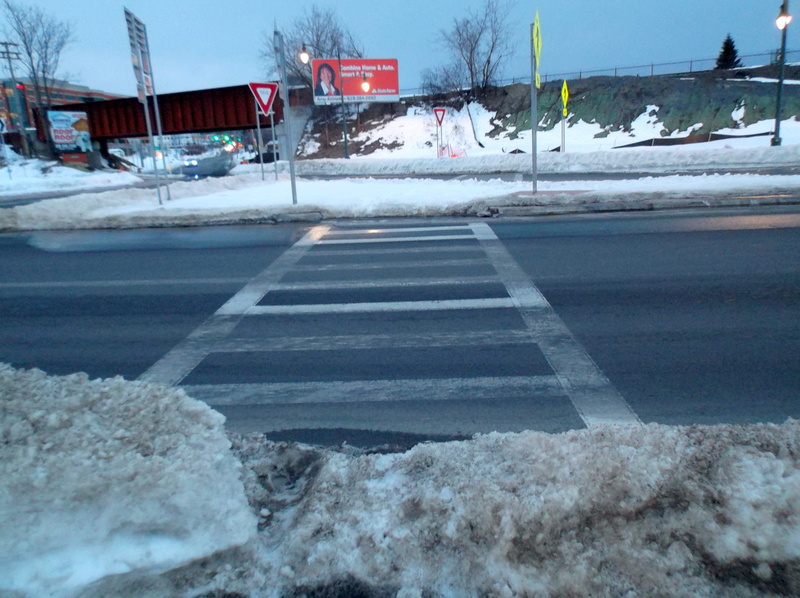 If a business had shoveled at its driveway, the curb at the intersection and crosswalk was piled even higher. I was left to walking at sunset on the side of a very busy road, with fast traffic and lots of puddles. Not pedestrian-friendly, Mr. Mayor. Not a good introduction to visitors on the ease of getting from Mohawk Harbor to our much-touted downtown Renaissance.